It was observed quite a long time ago that the structure of panel paintings in the early Renaissance is in direct relationship to their quality. Recent research – in this case deriving from two notable sources – has analysed the style of these structures through their historical evolution (Monika Cämmerer-George), and the aesthetic quality of the proportions of the panels in Duccio’s work (John White) . The latter highlights an important point, that these paintings are different from modern works in the way they are made– whilst we add a frame to a finished picture, mediaeval artists painted on a panel which was already framed. before the artist took possession of it. However, he does not give any examples of this practice, while Ettore Camesasca, who put forward the same idea in his recent study of artists’ workshops, gives only one . This theory is too specific to be founded on mere supposition; it should be based on a number of examples. John White’s more seductive hypothesis is the one which is currently taken for granted by academics in their publications ; and we shall see that this idea sometimes leads to unfortunate conclusions. Fortunately a great number of documents relating to this subject has survived from the 14th and 15th centuries – contracts, clients’ account books, and artist’ ephemera. This material has been published, some of it a long time ago, by researchers mainly concerned with attributions. Where these academics do not limit themselves only to the parts connected with their own interests, but have published the complete texts, we find many references to the period in question which they themselves have not bothered with. Wackernagel’s assertion is well-founded, but the phrase ‘it was not unusual…’ is perhaps too tentative. His hesitation is understandable, however: this practice of the woodwork being commissioned beforehand does not fit in with previous theories, and also conflicts with the ideas we have of the status of the artist. It is true that, as well as this custom, we shall see that there is also another, in which the painter subcontracts the panel to a woodworker; but we shall never find that woodworker employed in the artist’s studio. This arrangement would in any case have been an impractical solution. Let us begin with two cases which are quite well-known. The artists in question are Masaccio and Piero della Francesca, both of whom have been very closely studied, and as there are some surviving documents, it can be established who had direct contact with these masters. In the case of the altarpiece at Pisa, painted by Masaccio in 1426, we are fortunate in possessing the private accounts of the client, the sort of written record which rarely survives, and which is obviously of particular interest for our purposes. These accounts have come down to us in two forms: a book of daily expenditure, and another of debtors and creditors . In the latter book, the client notes – using the Pisan dating system, which is a year in advance of the Florentine – that the family chapel was begun on 14 November 1426 by Master Pippo di Giovanni of Pisa, and cost 140 florins, that ‘the panel of the altarpiece, that is, the wood’ (tavola dell’altare cioè di legname) was made by Master Antonio di Biagio of Siena for 18 florins, and that it was painted by Masaccio – ‘Maso… painted it’ (Maso… la dipinse, where la /‘it’ is the tavola returned by Master Antonio), that it was begun on 19th February 1427 (1426 in the new style) and cost 80 florins. In the other book, successive payments to Masaccio appear (these are very well-known), beginning from 20th February. In the same book there are notes of the payments made to Master Pippo, which have also been published; but those made to Master Antonio, which are certainly there as well, have not . Thus we have a client who seems to be his own agent. He acquires a wooden polyptych for himself, and – only afterwards – engages an artist of the status of Masaccio to paint it. As this seems surprising to us, it is tempting to suppose that Masaccio had decided beforehand on the form of the structure given to the woodcarver. It is, moreover, in this very way that things are arranged in Ettore Camesasca’s description of the usual process: the client often commissioned the panel in advance, but the painter generally used to present a sketch for it, as three examples bear witness, of 1456, 1495 and 1548, to which we shall return. 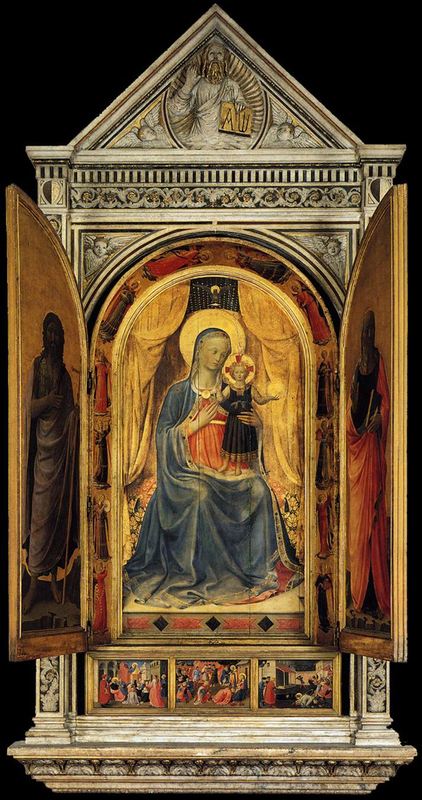 Nevertheless, in Masaccio’s case, several facts prevent the process from occurring logically in this order. Masaccio was living in Florence, where he had his studio; he went to Pisa for this specific commission, begun – according to the client – on a day which was recorded, and which fell after the construction of the panel. To suppose that he designed the structure of the woodwork necessitates his travelling to Pisa sometime previously, and without being paid for his design. We are tempted to think that this must have been so, because to us it seems impossible that an artist should not exercise personal control over the whole work. But in reality no precise fact exists to confirm this hypothesis, and when we look for other examples, what we find is only the confirmation that the artist did not normally intervene at this stage of the commission. Luckily, we can refer to another client’s account book in the case of the high altarpiece of Santa Felicità in Florence (now at the Accademia). This work, the Coronation of the Virgin, was painted jointly by three artists . 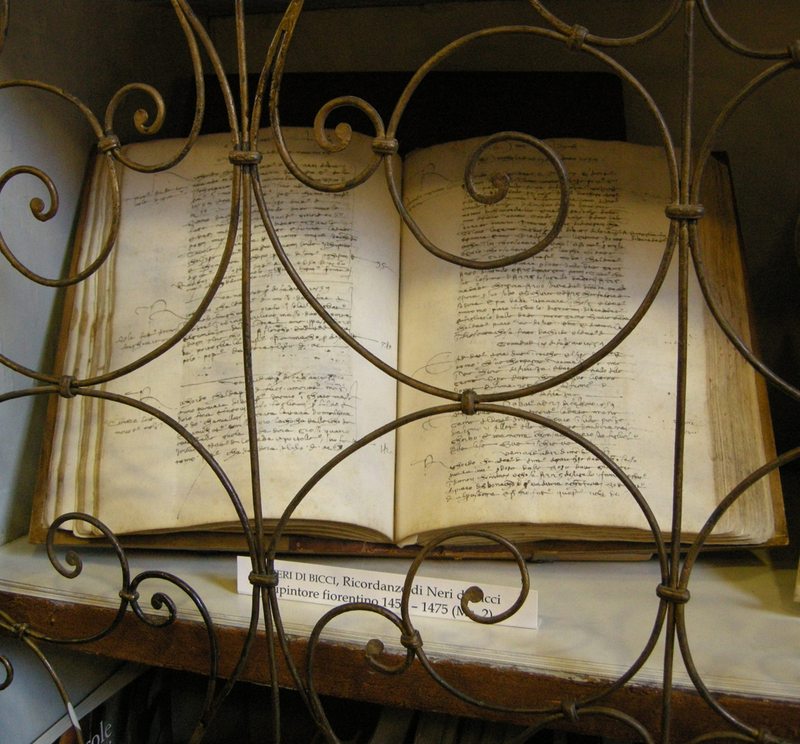 The entry in the account book reveals that it was commissioned by the Convent of Santa Felicità, using its own funds, and was completed under the abbess Lucrezia de’ Mozzi in 1401. In the diary kept from 1357 to 1401 by the abbesses, we read that the woodwork or tavola of the altarpiece was ordered in 1395 from Bartolomeo di Dino and Thomaso di Gligno, each of whom was a woodworker – a legnaiolo. Its price was fixed at 80 florins after consultation with no fewer than four masters, who are named in the text; ‘…so we have paid 80 florins for the wood alone’. Then in March 1399 (probably 1400 by our calendar), the abbess asked two agents (the operai) to make the arrangements for the structure to be painted – a dipingniere la detta tavola – by three artists, Niccolò di Pietro, Spinello Aretino and Lorenzo di Niccolò, in return for 100 florins. Four years at least separate the two stages. This lapse of time, probably caused by the need for the Convent to gather funds, reinforces the certainty that the artists had not supplied a design for the work, and that the woodworker had designed his polyptych just as he would have done any other piece of furniture. ‘Simon, otherwise Cini of Florence, master woodworker’ (Simon quondam Cini de Florentia magister lignaminis), the painter Spinello, and another painter, Gabriel, ‘formerly with Saracini of Siena’ (quondam ser Saracini de Senis). With the consent of the two painters, the woodcarver Simone agreed to produce a framed wooden panel (tabula lignaminis) in six months, and to deliver it either to the lay client or to the artists. Gabriel then agreed to gild it over the following six months, and Spinello to paint it over eight months, beginning at the same time as Gabriel. The timetable was evidently honoured, as the painting bears the date 1385. This work attracted Vasari’s attention; he remarked the inscription in pastiglia, bearing this date and the names of the three artists – Simone the woodworker, Gabriel the gilder and Spinello the painter. Starting from there, he invented a narrative (as he so often did), according to which Simone had made the frame (ornamento)  after Spinello had painted the panels (the tavola). Only the two side panels, with the names of Simone and Gabriel, have survived. This arrangement, by which the client dealt simultaneously with the master woodworker and the artists, might have been adopted simply because he wanted the work executed swiftly (which was indeed the case), and because he was gathering the necessary funds. The fact that the woodcarver was to act ‘with the consent’ of the painters might suggest that his was a minor rôle, and that he was therefore working to a design they had supplied him with. But this hypothesis is strongly refuted, both by the beautifully-inscribed linked names on the frames, and also by the payments which were made. The woodworker with his 50 florins was possibly receiving a salary which would work out as slightly less than that of the gilder, who – with 100 florins – had to pay for his gold-leaf, and that of the painter, who – also with 100 florins – had to procure more expensive materials than Master Simone, and had to devote more time to his work. That being the case, the ‘consent’ probably relates to the delay indicated in the contract: the painters agree to receive the woodwork from the carver at a specified date. On the other hand, the details concerning the gilder do not suggest that the work in question was that of a specialized craftsman. It is specified, in most contracts, that the gilding is part of the artist’s work, unlike the construction of the tavola. Under this particular contract, the man entrusted with the gilding is a professional painter. He and Spinello worked together and simultaneously on the altarpiece; in one sense, therefore, they were partners, and the process took two rather than three phases. The mistake made by Vasari in placing the woodcarver’s part chronologically after that of the painter obviously came from his own lack of experience in the matter of frames. It is astounding to note this total absence of any historic sense relative to technique; the polyptychs he saw had not given him any understanding of what remained the usual practice until at least the mid-15th century; which only goes to show how new standards rapidly come to be taken for eternal verities. This might appear strange in a man who had deduced from these very polyptychs a whole theory of the stylistic changes between periods; but his mind worked in the same way in other cases – for example, when he concertina’d time and confused two generations in dating someone’s life . Today’s art historians should feel correspondingly less culpable for not having grasped the rôle of the woodworker. ‘which he had had made and constructed… it was worked in wood’ (factam fieri et fabricari… laboratam de lignamine). Eugenio Battisti, convinced that the tavola must have been made in the painter’s studio, was thus induced to note it as ‘more than likely’ (piu che probabile) that another painter had received the commission before Piero . There is, however, no need to imagine this supplementary stage in the history of the work if we recognize here the process which we have already encountered, by which the master woodcarver executes the tavola for the client, who only then, as per the contract, turns to the painter. in return for 250 lire of Cortona. The work was to be completed in three months . But it is four years later (just as with the abbess of Santa Felicità) that the friars actually sign a contract with the artist, Antonio da Anghiari, to paint the structure, which was ‘to be placed on the high altar’ (positum ad altare maius) . 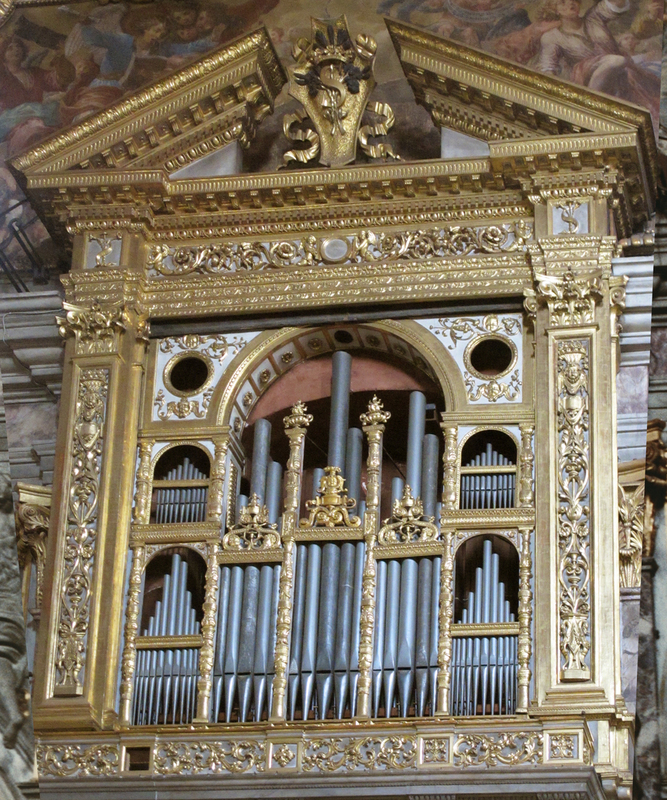 Piero’s tavola was later to be put up provisionally in the sacristy of the church for which it was destined, but this only constitutes a slight variation on the procedure. A curious clause in Antonio da Anghiari’s contract makes it clear that he is only to paint the front – the pars anterior – of the polyptych – perhaps because of a lack of money, which had already caused the four-year delay. 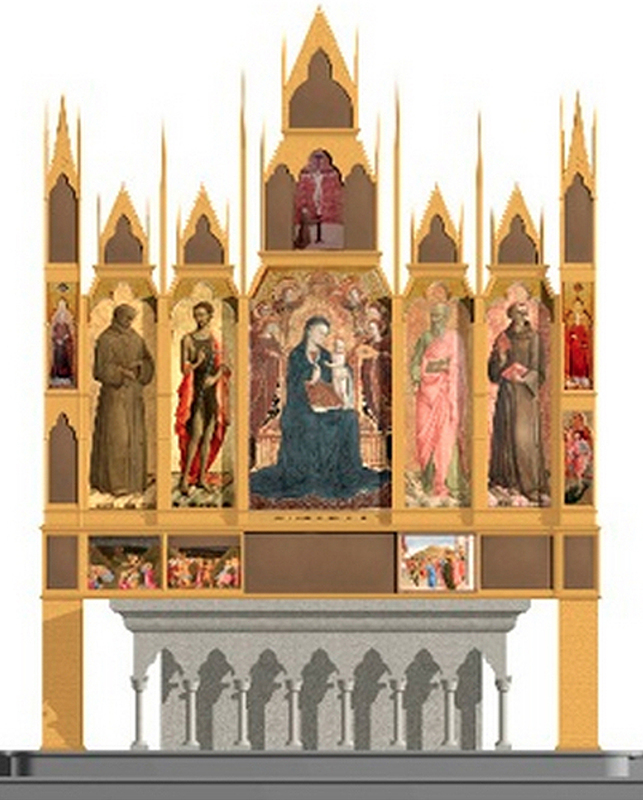 Reconstruction of Sassetta’s Borgo San Sepolcro altarpiece, front view. Credit for image: Reconstruction by Machtelt Israëls, James R. Banker, Roberto Bellucci, Rachel Billinge, George Bisacca, Ciro Castelli, Cecilia Frosinini, Christa Gardner von Teuffel, Babette Hartwieg, Elisabeth Ravaud, Andrea Santacesaria, Carl Brandon Strehlke, Dominique Thiébaut, Serena Urry et al. Three-dimensional drawing by Andrea Santacesaria, Opificio delle Pietre Dure, Florence. Rendering by Giacomo Tenti, Culturanuova, Arezzo. © Villa I Tatti, The Harvard University Center for Italian Renaissance Studies. Even more curiously, after seven years – in 1437 – a new contract for the high altarpiece of San Francesco, Borgo San Sepolcro, is drawn up with another painter, Sassetta . In this contract he agrees to have the woodwork constructed, and then to paint both sides of it. 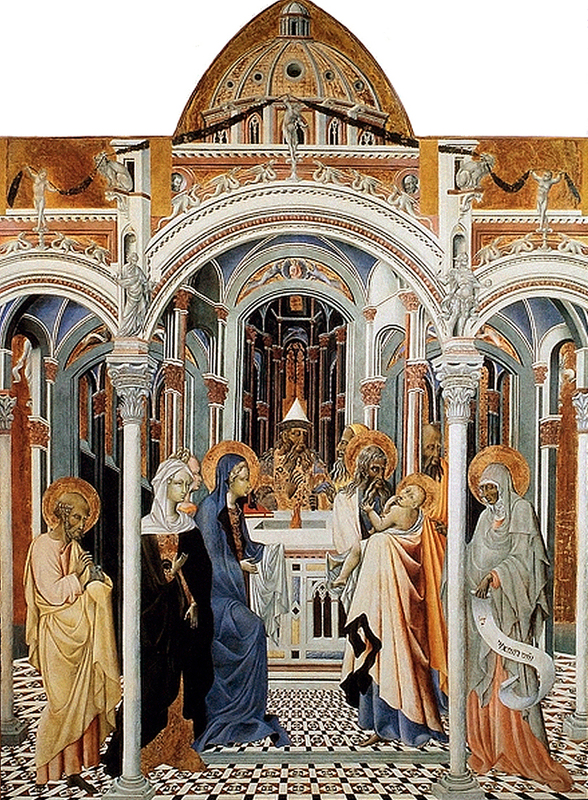 If this order given to the painter for the construction of the polyptych seems immediately contrary to what we have seen up to now, the difference is emphasized when we see a stipulation in the contract that the structure must be identical to the tavola already produced, and covered with the gesso priming for the original altarpiece. Why produce another identical polyptych? 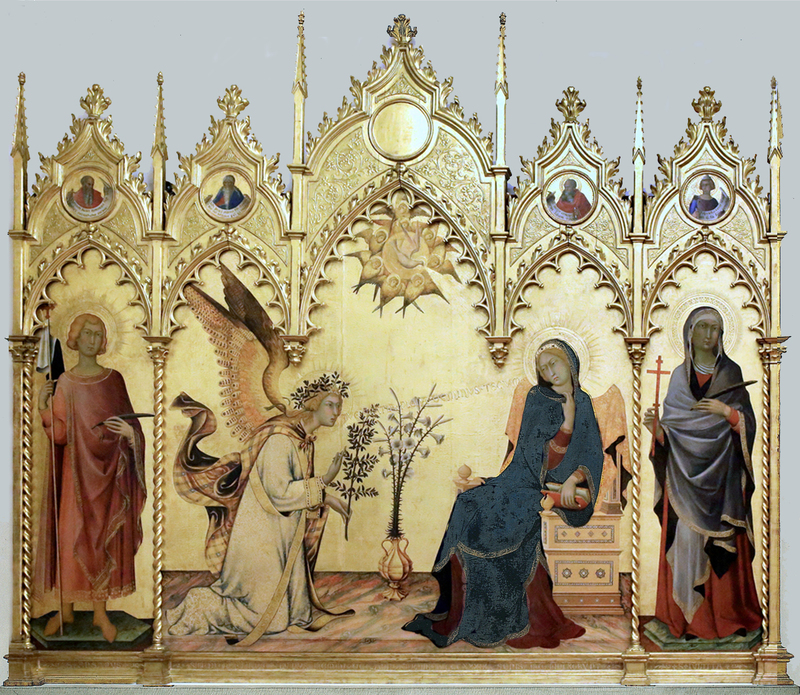 – but we understand the reason when we learn, further down the contract, that Sassetta is to deliver the completed altarpiece to the clients in Siena. This obviously implies that the artist would go home to Siena to work, and that he would also have the woodwork – the tavola itself – constructed there. The second tavola would thus not have to be conveyed from San Sepolcro to Siena, which might perhaps justify this way of proceeding. 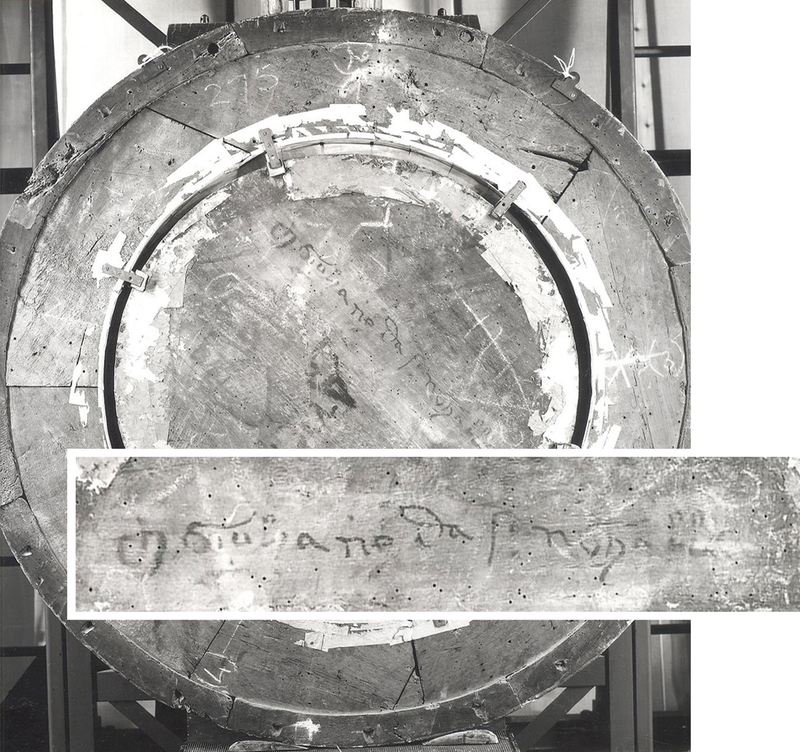 The documentary evidence of this particularly curious case seems to introduce us to a painter who has been made responsible for the construction of a wooden tavola. However, there might be another interpretation. We shall shortly see that, as well as the custom by which the client applies first of all to the woodcarver, an alternative exists, in which he deals exclusively with the painter, who then sub-contracts execution of the tavola to the woodworker. It is evident that the clients from Borgo San Sepolcro preferred to have the woodwork made in Siena in order not to have to transport there the polyptych already in their possession in San Sepolcro. If the tavola were not to be made in Sassetta’s studio but in the workshop of a carver, it would certainly be more convenient for them to have Sassetta arrange things with a sub-contractor, rather than having to negotiate the business themselves, from a distance. A possible explanation for Sassetta’s commission might perhaps be found in this fact, and removes the hypothesis by which the artist was presumed to have the woodwork made in his own studio. In his monograph on Sassetta John Pope-Henessy remarks that the Franciscans of San Sepolcro dreamed of realizing their altarpiece ‘from 1430’. Like other art historians who have examined cases of this kind, he dates the project from the moment that the painter enters the game, and takes no account of the monks having planned for the tavola from 1426, nor of the payments for the woodwork made in that year. He believes that the first painter, Anghiari, might have started the work and that the second contract with Sassetta ‘described a part of the painting as “already constructed and gessoed” (iam constructe et ingessate)’ . This is obviously wrong; what is described is the complete tavola, not a part of it, nor the painting. I shall now cite further variations on this type of contract, in large enough numbers to provide convincing evidence that it was a common practice. It is possible in one instance to describe both the practice itself and variants on it at the same time. This is the case of a painter who is sub-contracted, his work documented in a unique text from the beginning of the Renaissance – the journal of the Florentine artist Neri di Bicci, which provides a marvellous summary of the activities of a painter’s workshop . This journal has been too much neglected, only being published in part – although for understandable reasons. When it was studied by Gaetano Milanesi in the 19th century and Giovanni Poggi in the 20th, it was considered, like most artist’s documents, mainly useful as a source of attributions. Since Neri’s work presented no such problems, his art having limited attraction, and a large number of his inventoried works having been lost, the journal drew scarcely any attention at all. But for our needs it answers very well, even with recourse to only four of the twenty-two years it covers. Neri’s clients for altarpieces were so numerous that we can familiarize ourselves with his habits and do not have to rely only on certain cases. ‘tavola which Giuliano da Maiano has made of legname [wood] and quadra, all’ antica [which is rectangular, in the classical style]’ . According to his custom, Neri delivered the picture before the stipulated date. It is surprising to find the client supplying material other than wood. When Neri painted a canvas banner for a new brotherhood, the representative of the client ‘brought me a piece of the fabric’ . Here, of course, it was a question of a slightly less usual material, as opposed to the normal gessoed wooden tavola; however this variation reveals a little more about the implications of the process. 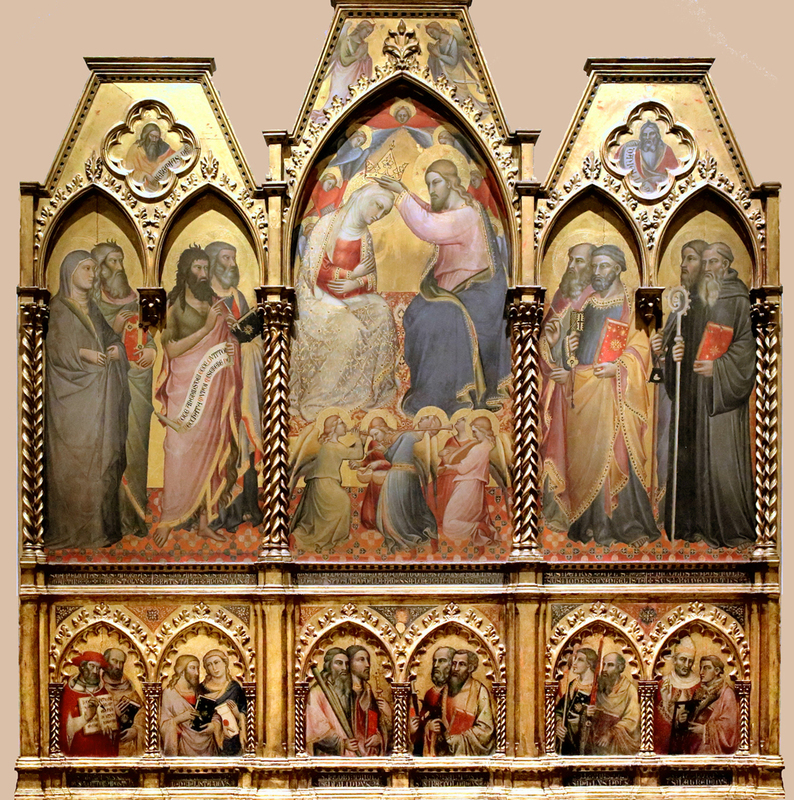 Another time, he undertook to paint ‘a rectangular classical altarpiece’ (tavola quadra all’ antica), which belonged to a client; it was an old tavola, with ‘three Gothic arched openings’ (tre cholmi apuntati), terms which describe a Gothic triptych more precisely than modern words could do. It was necessary to adapt this structure to a rectangular altarpiece [‘il quadro’], which Giuliano da Maiano did for 7 lire; the client, Neri notes, wanted to pay this sum himself, and this was agreed between them . So it appears that the process might be arranged either way – through the painter or otherwise. It should be added that, many years later, Neri was going to paint and gild a small altarpiece for which the tavola had also been produced by Giuliano, as we learn in a page of the journal for 1466 which has been published separately ; so there is no question that the years 1453-56 (which have been published as a complete period) are exceptional in this respect. In the examples above, the clients brought the panels to be painted to Neri, including, when necessary, the carved frame: they were dealing directly with the woodworker themselves. At the same time, Neri also employed another procedure. On 8th March 1453-54, he completed an arrangement by which he was to be reimbursed for all the expenses he laid out relative to the execution of an altarpiece all’ antica, including the wood (legname), the gold, the ultramarine and everything else . Must we then assume that because he bought the wood, he also constructed the panel himself? In another almost identical  but more detailed report of a similar arrangement, completed on 1st September the same year , Neri pledged to make an altarpiece in four months (although he took only three) for a price which included the legname and the painting – the dipintura. The payment is made to the artist not only for the painting but for the wood, which must mean both the materials and the labour. The way in which this process was organized is revealed in another note from the same day. 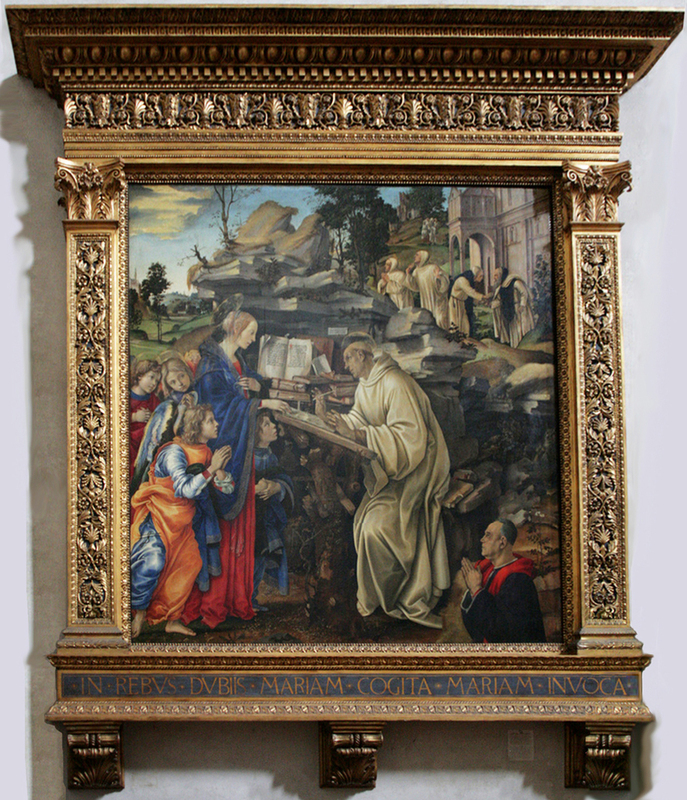 Neri orders (aloghai a) from Giuliano da Maiano the tavola for the altarpiece; – we can be sure that this is the same work, as the name of the client is mentioned. Apart from a remarkable feature which will be dealt with later, this shows us two things clearly. First, the method of sub-contracting: the artist/agent made things easier for the client by taking over the arrangements to be made with the master woodworker (perhaps in return for a small percentage). Second, and perhaps more significant, is the fact that the contract between painter and client does not reveal this secondary agreement. The artist assumes responsibility for the legname as well as for the painting: so a contract which anticipates the delivery of the completed work by the painter, ‘wood included’, (as in the case of Sassetta, examined above), does not prove that the work of the carver was executed in the studio. It is the same situation as that quite unambiguous one in which the artist engages in the contract to supply gold leaf and to guarantee its quality – we should not think of inferring from this that he beat the gold himself. He simply had to choose a good supplier. The same applies to the woodworker, but in this case the point has not always been understood. ‘I engage to make [the altarpiece] of wood for which I will pay’ (io debo fare’ [the altarpiece] ‘di legname a ogni mia spesa). It could be concluded from these words that he made the structure in his studio, if it were not that we are fortunate in having a postscript in which he notes that the contract has been annulled because, ‘I have not been able to get the woodwork’ – the tavola di legname. He lost the commission because of something which could not have arisen had he made the woodwork in his own studio. We may conclude from all this that not only had he not made it in this case, but that he never used to make it. This specific tavola, it should be noted, would also have had tre cholmi appuntati, and the problem might have stemmed from the increasing difficulties of procuring Gothic tavole in 1455. 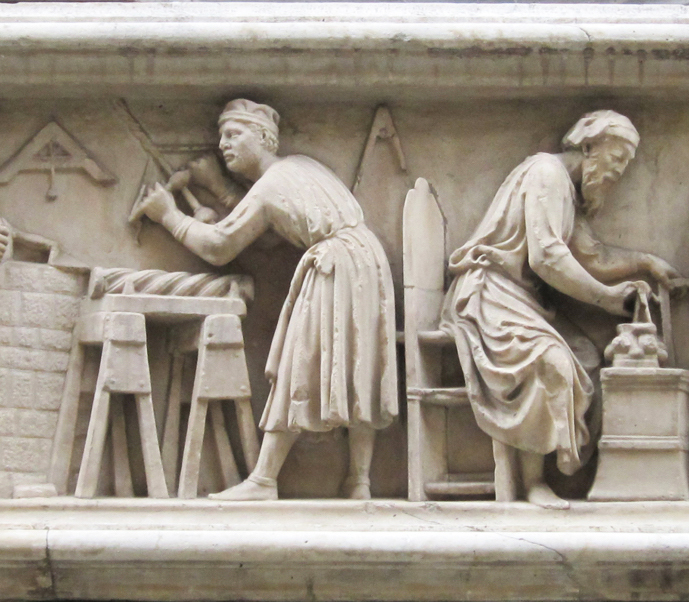 In a final example, Neri writes on 26th April 1456 that he must produce a wooden altarpiece (tolsi a fare di legname…); and he gives very precise information as to how the capitals, the predella and the pilasters are to be made . On 26th May he entrusts the execution of it (aloghai) to Giuliano for 50 lire – although the latter had demanded 60 at first – and notes down again all the details of the commission. The ratio between the amount paid for the painter’s and the carver’s work is the same as in the case of Masaccio’s altarpiece, where the woodworker’s share represented 20% of that of the painter. It seems that Neri went to the little town of Poggibonsi to settle the contract with his clients, a brotherhood there, which included the construction of the panel – then sub-contracted by Neri. This method of proceeding is exactly what Sassetta may have adopted in 1437 for the altarpiece of Borgo San Sepolcro. ‘…in Neri’s large studio – a workshop, in fact, of the arts – all types of woodworking and carving (legname and intaglio) were made’ (a note at the bottom of the page cites Giuliano as the legnaiolo most often employed by Neri). This grave error relative to a studio specializing on the contrary mostly in painting has certainly added to the general misconceptions of the period and of craftsmen’s workshops, and also to Milanesi’s reservations in respect of this journal. In interpreting it he reduces it systematically to a series of very contracted abbreviations, and regrets that there is little point in mentioning all the Madonna panels, amongst which it is impossible to identify those which have survived. Of course, the secondary contracts are not limited to the higher echelons of craftsmen: Giuliano sub-contracted another specialist for part of his own work. We know that gilding was the painter’s responsibility, and often included in the arrangement agreed with the latter (as Cennino Cennini indicates, and as Neri has also made clear); it therefore seems certain that the gessoing of the woodwork formed part of the carver’s work, and that he delivered the panel ready-primed, like a modern canvas. This fact also seems implied by the document mentioned above, relative to Sassetta, where the unpainted woodwork included its gesso coating in the actual construction; and it is reinforced by a note in a register which indicates that on 8th July 1463 Giuliano owed 2 lire 4 soldi to the painter Alessandro Baldovinetti for the ‘gessoing of a large rectangular altarpiece’ (ingiessatur d’uno quadro grande) which Giuliano then sent to his client Bernardo Rucellai . This note has been thought ‘very curious’ by Baldovinetti’s excellent biographer, Ruth Kennedy, who describes the reasons for proceeding in this way as ‘rather unclear’. She includes, in order to reject it, an hypothesis according to which Rucellai was an amateur artist who had commissioned the panel for his own use, and explains that ‘artists in general prepared their own material, rather than receiving it already completed from their clients’ . On the contrary, as we have seen, artists accepted prepared panels from clients such as Rucellai, who had bought them from woodcarvers like Giuliano. Rather than thinking of craftsmen as executing the whole of the finished product from the raw materials, we should concentrate on the capitalist society of Florence after its commercial revolution, which brought about an effective division of labour . Neri’s commission of 1st September 1454 conveys further significant information. We have noted that on that same day he ordered (aloghai) the tavola from Giuliano. On 3rd September he notes that he has received the said ‘wooden panel, that is, the square support alone’ (tavola di legname, cioé il quadro solo). The woodcarver was therefore able to deliver a quadro – the rectangular support, ready to be painted – immediately, which explains how Neri was able to complete his work only three months after it was commissioned. What this means is that he received only the actual panel – the picture surface alone, or the quadro solo, and the frame – the remainder of the order – was to follow later. So it would appear that the frame could be applied to the completed painting, just as it is now. There would be no problem with measurements, since Giuliano had produced both the panel and the frame. This constitutes a very different method of proceeding from what was usual for a polyptych, where all the woodwork (apart from any applied mouldings, which could be fixed on later) had to be finished before the painting could be executed . The quadro, the rectangular picture that we know today, was thus something of a technological revolution – and also caused a revolution in the market, since the artist was now able to promise a much more speedy delivery of the complete work to the client. This explains, to a great extent, why the polyptych passed rapidly out of fashion during this period and was replaced by the quadro. Today quadro has become synonymous with ‘picture’, even if the quadro is a tondo! It is understandable that the sub-contracting of tavole by artists should be so little known. The written agreements – when they existed – were in ephemeral documents which have rarely survived, and where they have, have attracted scarcely any attention from researchers. The documents relating to woodcarvers still need to be studied. However, we can still occasionally find a sub-contracting agreement emerging from behind the contracts between artist and client. 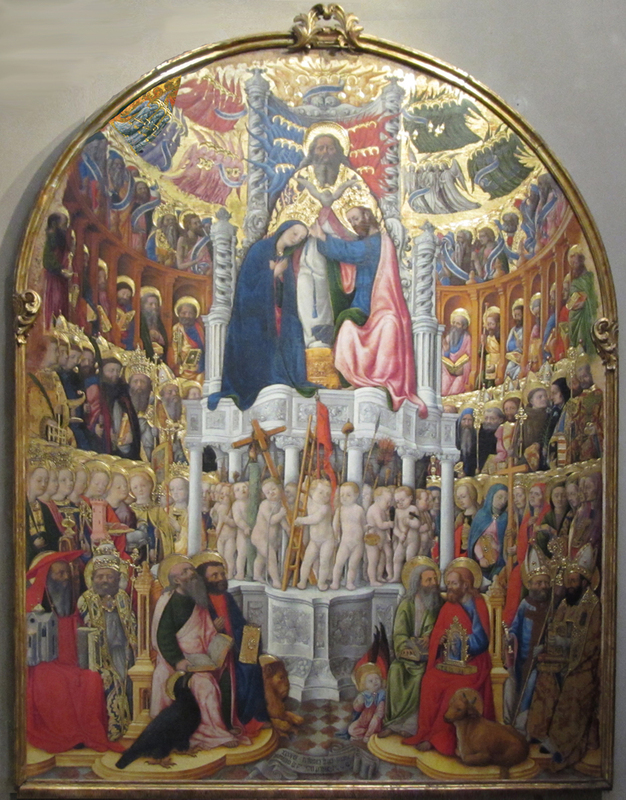 In Siena, for example, on 11th April 1447, Giovanni di Paolo agreed to paint the Arte dei Pizzicaiuoli altarpiece . He engaged to gild and paint ‘the altarpiece and panel’ (tabulam et frustrum) with gold leaf and colours, and then to install it; and the first paragraph of the contract states that the said panel – the fructum dicte tabule – will be ‘made from good wood’. The difference between the passive voice employed for the panel (fieri facere) and the active, relating to the painting and its installation (pingere, imponere), is revealing. As Giovanni was to be paid for everything in one go, he paid another craftsman for the first part of the work, and did the rest himself. It is interesting to observe this taking place in 1447 in Siena. 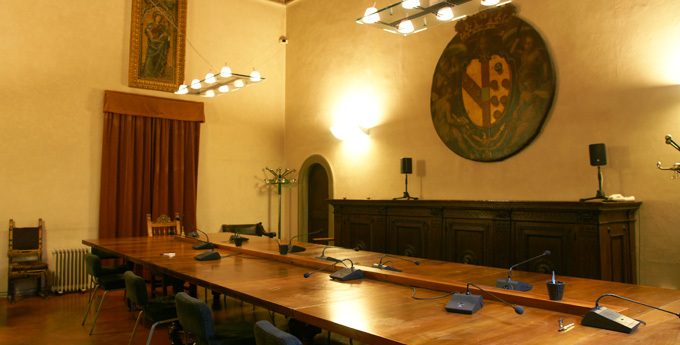 We might also have suggested the existence of a sub-contractual arrangement for the panel in Sassetta’s contract – again in Siena – in 1437, and could now support such a suggestion by showing that this practice was normal in the town. Only one thing might be an objection here: Sassetta’s contract uses facere in the active voice relative to the construction of the panel. However, this grammatical form is not so significant, as the documents relating to Neri di Bicci also use the active form when his recourse to a sub-contractor is concerned. And we do have an important number of documents relating to legnaioli making tavole which are then sent on to the artists by the commissioning clients. A series of such transactions could be cited here, the artists ranging from unknowns to the great masters. In Florence in 1346 the Compagnia di Gesù Pellegrino at Santa Maria Novella, setting in motion the execution of an altarpiece for their chapel, recorded one of their members having paid 5 florins, the price of the wooden altarpiece – the tavola di legname – with its predella and columns. A bargain was then concluded (fece il merchato) with a painter, to complete the said altarpiece (la detta tavola). In 1345 and 1346, in Pistoia, money having been collected for an altarpiece for the church of San Giovanni, master Francesco da Siena was paid for the ‘making and the wood’ (facitura e lo legname) of the tavola for the high altar. After this, more money was sought in order ‘to contribute to the painting: dipintura della tavola’, and in 1348 Alesso d’Andrea was engaged to paint it . In Siena in 1380, Master Francesco del Tonghio and his son made (fatta) a tavola for the Operas del Duomo. Its price had been fixed by two arbiters, Cecho del Guiccha, a master woodworker, and a certain Stefano. The document which was drawn up was kept as the basis of an estimate for the tavola . The single fact indicating that it was the wooden structure which was being organized here is the client’s choice of a woodcarver as his financial adviser. This is confirmed by the knowledge that the maker of the tavola, Master Francesco, was also involved in the carving of the choir stalls in Siena Cathedral – work which took several years. 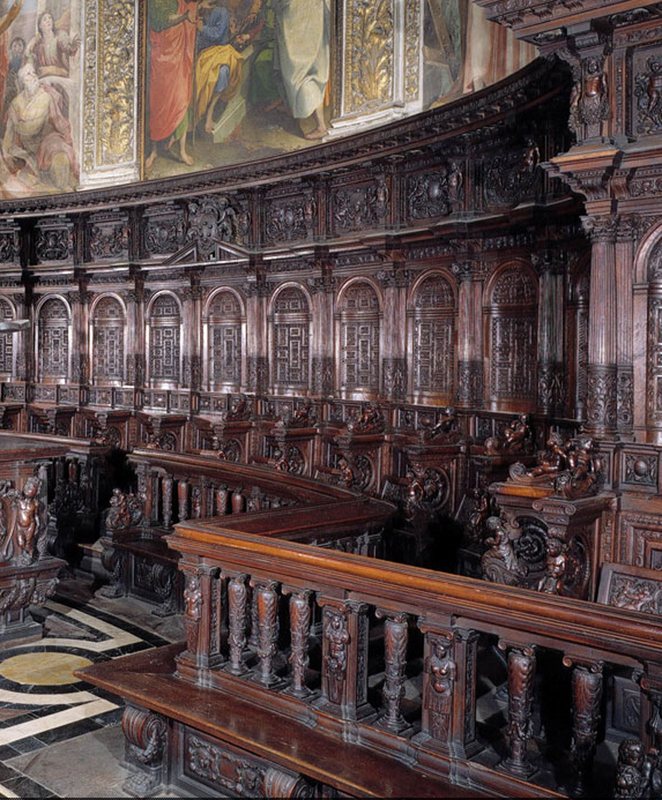 All the same, the word ‘tavola’ taken in this sense is so unfamiliar that we were not surprised to see it recently translated by an academic as ‘painting’, even though, a little later, he writes about Francesco, the carver of the choir stalls . Again in Siena, in 1398, when the woodcarver Barna di Turino is paid for various pieces of work completed in the cathedral, his invoice mentions an earlier item, ‘the altarpiece made of wood’ (la tavola di legname fecie), found in such and such a chapel and painted by Paolo di Giovanni – obviously the artist Paolo di Giovanni Fei. As the high altar of the chapel appears in another document, with a record of its subject, it has recently been linked with a surviving work by Fei of this very subject [The presentation of the Virgin in the Temple, 1398-99, National Gallery of Art, Washington ] . The researcher who made the connection was equally intrigued by the rôle of Barna, revealed in the invoice. It is ‘highly probable’, he suggests, that the latter had prepared the panel, and perhaps carved the decorative elements – the frame with its pinnacles. The uncertainty seen again here results from the same lack of familiarity with the method of production, according to which the carver rather than the painter produced all the woodwork involved, as Barna did here, and which the documents indicate very clearly. whose name also appears on the document as a witness . 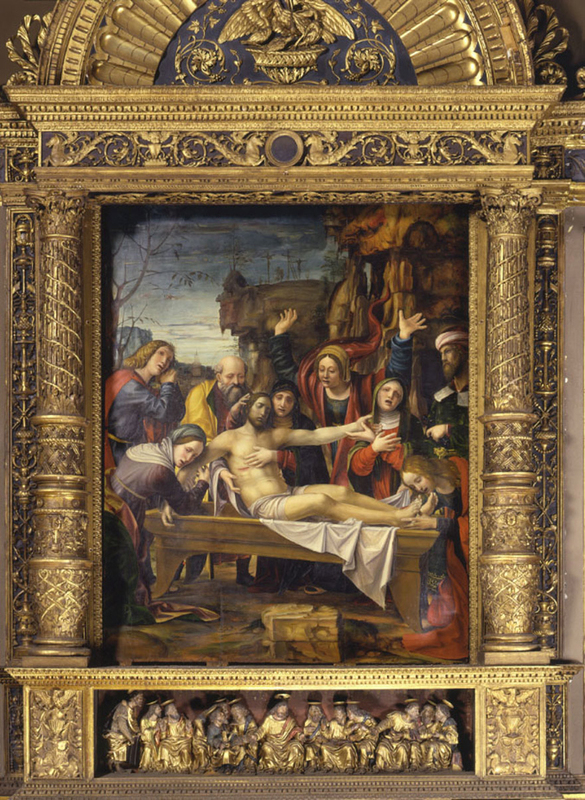 We learn that the period of two years granted to Lorenzo for the painting was to begin when the tavola was delivered, finished (expleta), to his home or his studio (domo et sue apotheca); the fact is thus openly stated that the woodwork and the painting were executed in separate workshops. In this respect, attention should be drawn to the different verbs used here (as elsewhere): the artist is to paint – pingere (and gild); the woodcarver, to make – facere. which was designed for the altar of the chapel newly built in memory of Chiaro . Then on 3rd January 1399 Lorenzo Monaco was paid for part of his work of painting the tabula. We shall see other arrangements made relative to Lorenzo’s panels. 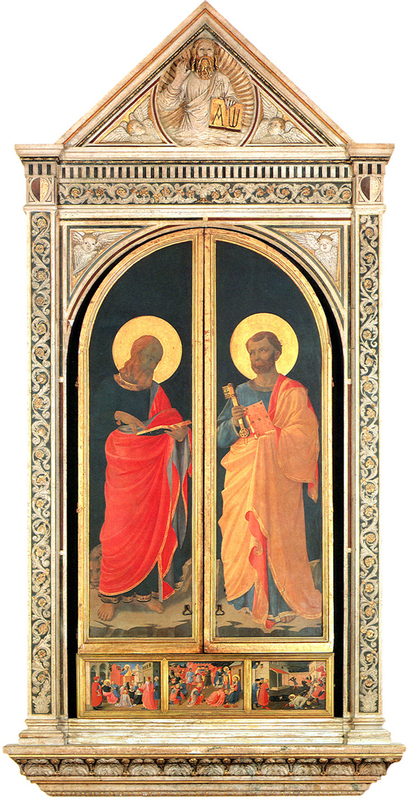 We can find another famous example in the Florence of 1432: the Tabernacle of the Linaiuoli, which is unique in having a double frame. The guild of the Linaiuoli or linen workers made a partial payment on 29th October 1432 to Jacopo Papero, legnaiolo, for the construction of a panel for the great tabernacle of the guild (fare e legname del tabernacolo grande di dette arte). They had previously paid Lorenzo Ghiberti 3 florins for a model of the work. 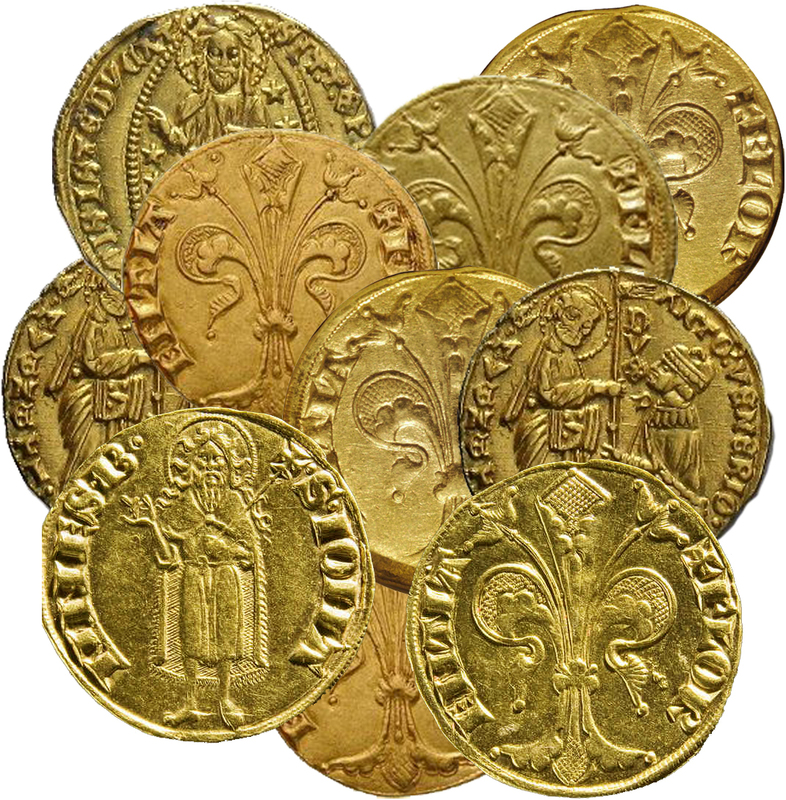 On 2nd July 1433 the outstanding balance was to be paid to the legnaiolo . 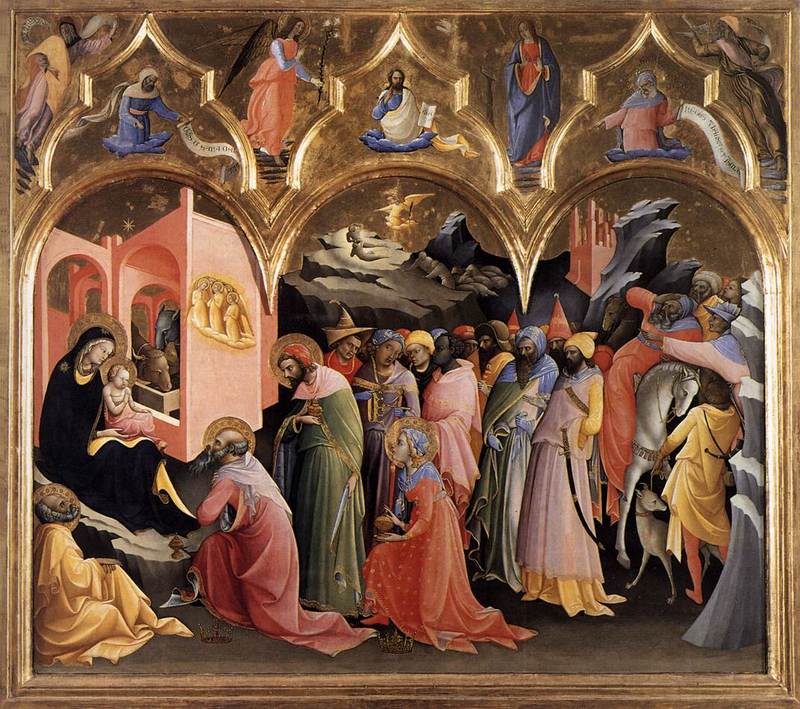 It is worth emphasizing that it is only after this – although immediately after – that on 11th July a contract is drawn up with Fra Angelico to paint the tabernacle – dipingere uno tabernacolo . As soon as he began the work on 11th August 1433, ‘the marble tabernacle where Our Lady will be placed’ was ordered, based on the design by Ghiberti . It is not very exact to describe the resulting double structure as ‘wood and marble frames’, as R. Krautheimer does ; the marble tabernacle completely encloses the painted wooden triptych. This sumptuous arrangement originates from the fact that the work, which was intended for a secular setting – the great hall of a guild – was not to be placed on an altar, but built into a wall as it is today. This point should be underlined, since the work is so similar in other respects to an altarpiece that it is automatically referred to as such . It was, rather, like pictures of the Virgin designed for domestic use – portable altars – but considerably larger; and this link with tradition explains its construction with hinged wings, enabling it to be closed. This feature is seen often in domestic altarpieces, but never to my knowledge in large-scale Italian altarpieces of this period . Its monumental scale is probably the reason a model was made beforehand by Ghiberti, who was expert in the design of such shutters. Leaving Florence briefly for Brescia, we find a reference in the relevant accounts for 8th November 1418 to payments made to an anonymous joiner for an ancona fata, which was in the process of being painted by Gentile da Fabriano, and which was intended for the Pope . Back in Tuscany, and in the following generation, there are interesting details to be found in the abundant documentation for Pesellino’s Santa Trinità [sawn up in the 18th century, most of the Trinity is now in the National Gallery, London, in a reproduction frame of 1937]. This work is exceptional, in that the client – a brotherhood of the clergy of Pistoia – kept a record of every stage of the process; so we can see how the idea was mulled over before the commission was made . On 10th September 1455 the members of the brotherhood had a meeting – apparently for the first time – on their lack of an altarpiece. They voted to have one made, and discussed both the cost and their choice of saints. The same month they went to Florence, and gave one order for the woodwork and one for the painting – the latter to Pesellino. The tavola was commissioned from Antonio Manetti, who as a master craftsman of wooden altarpieces (maestro della tavola) received a part-payment on 26th September. The omission of Manetti’s rôle from the detailed study of the altarpiece by Martin Davies  is what we have come to accept; however, it should be highlighted, as it is quite surprising to see such work being executed by a master who was also the capomaestro of the cathedral [but see this, on Manetti], directing the work which was being carried out on the lantern of the Duomo, and during these years was engaged on the building of the Annunziata, San Lorenzo and Santo Spirito. 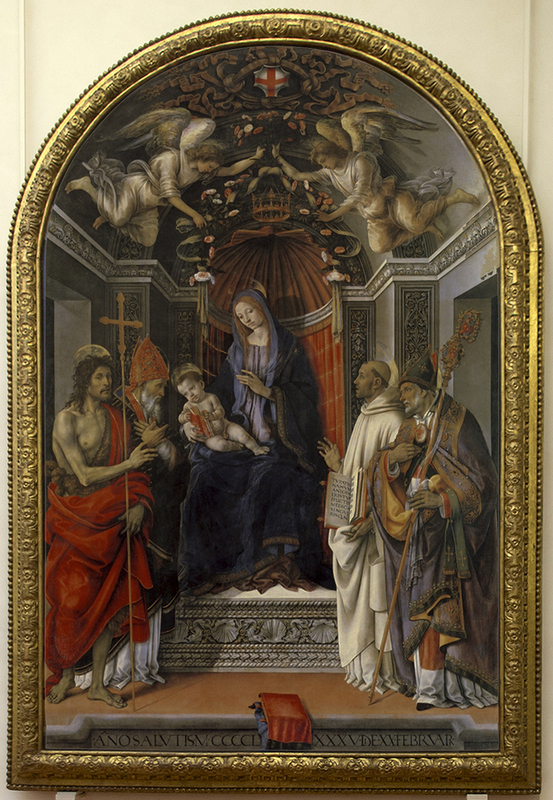 It gives us some idea of the prestige attached to an altarpiece of this kind, and recalls the collaboration between Giuliano da Maiano and Neri di Bicci which took place at around the same time; that is to say, a simultaneous co-operation new to the production of panels and paintings. 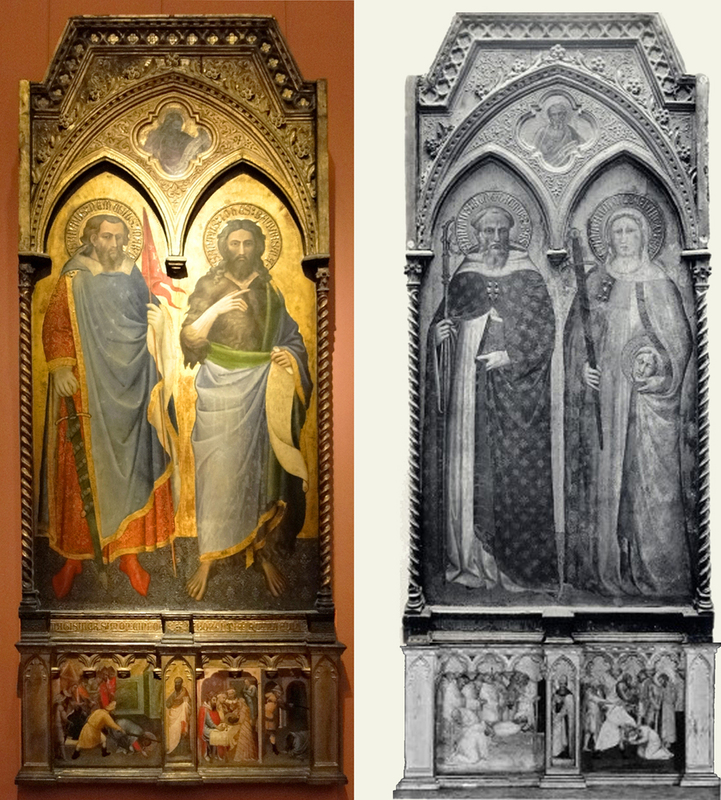 Thus it is possible that the evolution of the polyptych into the quadro during this period might be connected with the participation of the most accomplished legnaioli. We shall shortly see other instances of this occurring. In Bologna, on 19th July 1473, the woodcarver Agostino de Marchi lodged a bill concerning payment for a frame he had executed for the altarpiece of the Griffoni Chapel in San Petronio . It is the only document relating to the Griffoni polyptych, by Francesco del Cossa [and Ercole de’ Roberti]. It is regrettable that the author of the most recent monograph on the work suggests, without any discussion of the subject, an earlier date for the painting itself ; he also raises again the execution by Agostino of woodcuts based on drawings by Cossa, and by analogy suggests that Agostino based his frame as well on a design by the artist. However, this work was a polyptych, and the woodwork for it had to be completed first of all – never mind the fact that the paintings have generally been dated after 1473 (obviously for stylistic reasons) by previous researchers . intaglio del fornimento della tavola fatta per Sandro Botticelli – ‘the carving of the frame for the panel made for Sandro’. Then on the following 3rd of August he pays Botticelli 78 florins 15 soldi – an indication of the cost of the ultramarine, gold leaf and labour of gilding, as well as of his own work – ‘his brush’ (sua pennelo) . As we have the breakdown of what Botticelli was paid for, it is pointless for us to ask whether he could also have made the actual panel (if the formula of the earlier document – ‘the woodwork made for Sandro’ – la tavola fatta per Sandro – is interpreted in the sense of ‘made by Sandro’). On the contrary, it should be understood that this case is just the same as all the others where the legnaiolo made the panel as well as the frame. Botticelli painted the picture after Giuliano had executed the carving, but the periods of separate work probably partly overlapped, if (like Neri) the artist received the quadro to paint from the legnaiolo at the same time that the latter began work on the framing. Giuliano is linked to Botticelli again in a case which has been complicated unnecessarily. A tondo from Botticelli’s studio in the National Gallery, London, has on the reverse the inscription, ‘M. Giuliano da san Ghallo’ . An earlier scholar saw this as Giuliano signing the actual painting – this is the absurd consequence of the tendency, common in art history, which sees every inscription with the name of an artist as a signature. However, it is not entirely wrong, as it is evidence that what Giuliano had actually executed was the panel itself, and that he should be paid for his work. Martin Davies came close to the truth when he suggested that the inscription meant that ‘the picture had been put to one side in Botticelli’s workshop with the name of Sangallo on the back to indicate that it must be sent to him in order to be framed’. We only have to reverse the sequence of events – the dispatch having been made from Giuliano to the artist’s studio. This is more satisfying than the commonly accepted interpretation, in which the inscription identifies Giuliano as the owner of the painting. In the same period we find Giuliano producing another tavola for the great Ghirlandaio altarpiece in the Innocenti. The case is particularly well-documented, and includes changes to the project and the other illogical incidents to which we should always pay attention . Here again we are able to refer to the client’s account book – which is less rare of its kind as this time it is a question not of an individual but of a hospital represented by its prior. The story begins in 1486, when Ghirlandaio engages to produce an altarpiece in thirty months for 115 florins. He is to execute the painting, and to use both gold and ultramarine on a ‘piano’ supplied by the client’, and – apparently to simplify the accounts, by which the artist is to procure all the materials – the latter is to ‘pay’ the prior for the piano. We have here a striking illustration of the practice by which the client supplied the artist with the support to be painted. The word ‘piano’ may be understood in reference to the picture which has come down to us, a panel a little higher than it is wide. We are lucky that this is so clear, since the word is unknown to lexicographers – even to Baldinucci in his dictionary of Tuscan terms of art. Although the word for ‘ground’ might very well have been used, we may take it that in the nomenclature for what was replacing the polyptych, this lost out to the term ‘quadro’. An important detail confirms that the shape of the piano was a straightforward rectangle: it was not previously known whether Ghirlandaio had also been responsible for the predella of this altarpiece, but a later negotiation turns out to have been recorded, which is connected with a supplementary payment for this part of the work. In turn this led to a well-known document detailing payment for the predella to another artist, Bartolomeo di Giovanni (which Bernard Berenson used, to prove this artist’s existence). As all Ghirlandaio’s technical obligations were spelt out, we can conclude that he was not expected to size the panel, which was sent to him already prepared – and we have already learnt that the gesso was applied under the supervision of the legnaiolo. Here, too, work on the frame, commissioned separately by the client, was done partly in parallel with the painting – although this time it was begun later. However, its completion had been expected ten months earlier, as is apparent from the contract drawn up by the prior with the legnaiolo Antonio di Francesco, who had supplied a design (exactly as Ghirlandaio had, for the composition of the painting). The design provided, not only for the frame itself, but a tabernacle for the Host and two carved and gilded candelabra. The document explains that this new frame is identical with the frame of the high altarpiece ‘at present’ in the church of the Gesuati. Hence this design shows two angels which are not included in the new commission for the Innocenti, and we learn from this that Antonio’s design must have been a stock modello, capable of being reused. We do not know whether the earlier frame in the Gesuati was his, but the Altarpiece of the Gesuati was also by Ghirlandaio; it is now in the Uffizi (above) . In March 1489-90 a payment of 56 florins for the Innocenti frame, with the additional tabernacle and candelabra, was made, but it was received by Giuliano da San Gallo, the brother of Antonio, the legnaiolo mentioned in the contract. Filippino Lippi, Madonna & Child with SS John the Baptist, Vittorio Vescovo, Bernard & Zanobi (Altarpiece of the Otto Pratica), reframed. Galleria degli Uffizi, Florence. ‘carved frame made to surround the picture’ (the ornamento intaglio facti circhum circa tabulam). The artist received 1200 lire and the legnaiolo 500 ; in connection with which Van Marle – in a quite understandable mistake – states that the painter was remunerated at the same time for both picture and frame . Filippino’s St Bernard also illustrates the process according to which the client first buys the tavola. 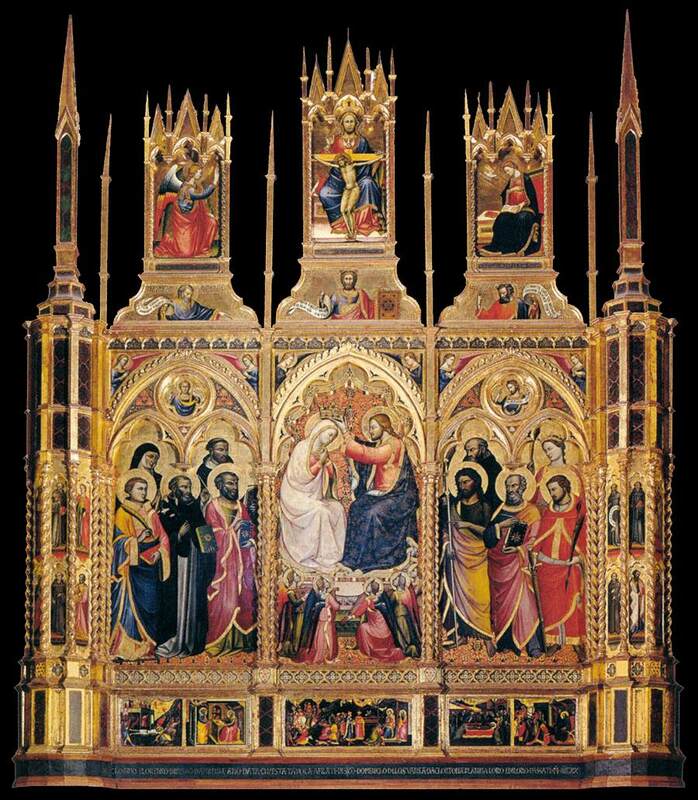 A summary drawn up by the clergy of the sums paid out over the years by Francesco del Pugliese for his chapel records the expenditure on the ‘woodwork of the altar’ (tavola de altare) and then on the ‘painting of the altarpiece’ (dipintura dello altare) . is paid for a panel, or ancona, for the church of Santa Maria Gualteri. He undertakes, should flaws in the panel appear within three months, to make them his concern . We perhaps owe the survival of this document to this guarantee clause. Two years later, in 1499, the ancona was painted by Foppa. This list may be ended appropriately in 1500 in Florence, when Baccio d’Agnolo signs a contract with a brotherhood of the Annunziata to make a frame for 250 scudi. On its completion in 1503 the client applies to Filippino Lippi to paint it. 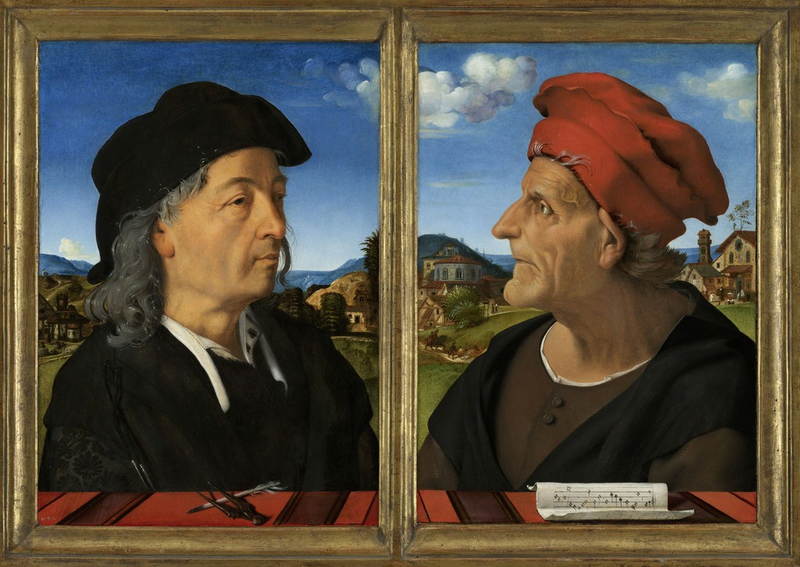 The latter begins the painting just before his death, after which – as is recorded – Perugino carries out the remainder of the work . One of the surprises revealed by this list is the presence of notable artists among the framemakers. In the second half of the 15th century these included Florentines such as Giuliano da Maiano, Antonio Manetti, Giuliano da San Gallo , Tasso, and Baccio d’Agnolo: a list which could hardly be more impressive in this town, and for this sort of work. Of course the rediscovered contracts relate especially to the more prominent artists – so much so that the number of works attributed to these men will doubtless be added to. But the existence of a collection of works by the best artists in wood is what matters. We must conclude from it that woodcarving was considered an important element of the altarpiece, and not a mere incidental accessory to the painting. 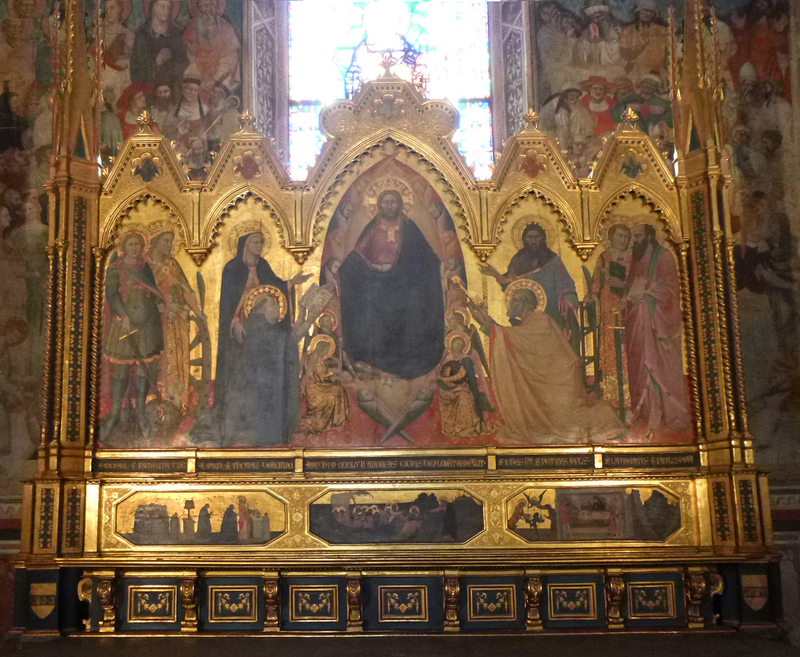 ‘This altarpiece was made and erected in this place by Lorenzo the painter and Canino the carver’ (Hec tabella facta fuit (et hic) Afissa per Laurencium Pictorem et Caninum Sculptorem) . And – still in Venice – we have two works, both large Coronations of the Virgin, signed jointly by the artists and the same woodcarver. In the first case, Jacobella del Fiore is named; the two inscriptions which seem to have appeared separately on the frame and the panel are lost and their nature is therefore debatable. ‘Cristoforo of Ferrara carved it, Giovanni and Antonio of Murano painted it, 1444’ (Xrofol de Ferrara intaia. Zuane e Antonio de Muran pense, 1444) . The rôle of the legnaiolo is as important and honourable as that of the painter, and this appears openly in Venice at an earlier point than for the Florentine artists. The most positive evidence of the equal estimation in which these various artists were held is found in a curious poem written in 1488 in Fano, about an altarpiece by Perugino. The woodcarver was the master Gioachino di Biagio d’Urbino, who, according to the contract, agreed to construct the work ‘from wood he had purchased’ (suis propris lignaminibus), to a design by himself, factam per ipsam. The notary who registered the deed, Piero Domenico Stati, added a poem which was only published a few years ago , in praise of the two artists. Perugino is ‘the foremost painter in the world’, whilst, as for Gioachino, ‘he has no equal’, Piero says, ‘for carved panels’. The two artists are ‘a second Parrhasius and a second Lysippus’, according to the poem, which is written in enthusiastic if mediocre verse. It is quite likely that in the small town of Fano the notary was directly involved in realizing the altarpiece, and was able to appreciate these two masters, who had come from more important cities. ‘of carved wood, according to the design given to him’ (de legname intaiado, segundo el disegno a lui dato). (‘…a lui dato’ is an ambiguous phrase: we shall see that the design had been submitted to the client, exactly as it had been at Fano). He is to receive 31 ducats, and at the end of August he is to deliver his work to the artist, master Zua Batista da Conegia, or Cima da Conegliano. Cima himself simultaneously agrees to create ‘a painted and gilded polyptych’ (pala de pictura e dorada) for 70 florins, which was in payment for ‘only the gold and the painting’ (l’oro e la pictura solamente), and to deliver it in time for Christmas. He will paint the figures indicated on the design ‘given to you by the carver’ (a loro dato per lo intaiatore) . The situation is clarified when we notice that each of the contracts has been countersigned, as witness, by the other artist. 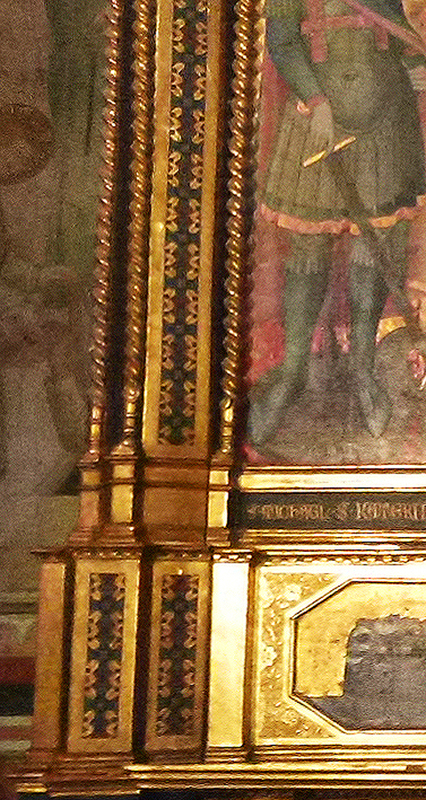 But the most useful of the points raised here is that concerned with the design supplied by the woodcarver, ‘given …by the carver’ – dato per lo intaiatore (this resolves the ambiguity noticed above): the names of the chosen saints have now been noted, to serve as references for the painter. This recourse to a contractual design to direct the work of the two masters places in a revealing light an interesting small group of drawings for frames which one encounters sporadically in the course of research, but which have been little studied. They are particularly connected in this context with the districts around Venice, in about 1500. – a man whom we know lived in Venice between 1510 and 1528. This is therefore a contractual drawing, and Frerichs has linked others of the same type with it, and also with the Cima document just cited. However, she is mistaken in remarking that it was ‘gewoonte… dat de schilder van een altar tevens de lijst ontwerp’ [‘customary… that the painter of the altarpiece should also design the frame’], and in relying on the case of Cima to say that the design was ‘voor de lijst maker bestemd’ [‘for the framemaker’]. 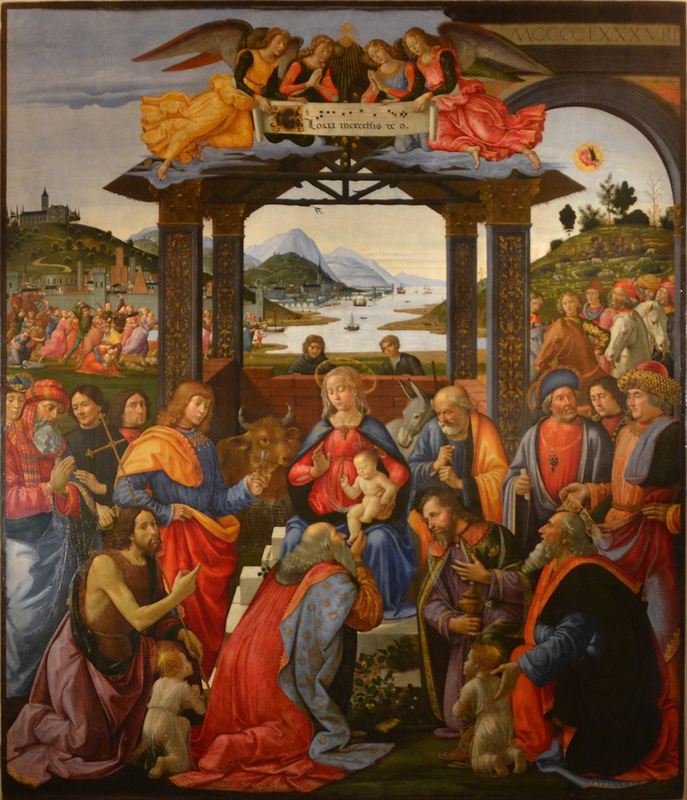 As we have seen with this very altarpiece by Cima, with Perugino’s at Fano, and with the altarpiece of the Innocenti in Florence, the designs were supplied by the creators of the frames themselves. The mistake is understandable because of the difficulty presented in interpreting the document concerning Cima, and even more because of the generally-accepted opinion that in cases like these the painter is the person to whom the invention and the design belong, the woodcarver bringing only his skill as a journeyman. Frerichs has assembled numerous similar designs. One which she is probably right to consider as a contractual drawing (above) has an inscription; it has been, with reservations, attributed to Benedetto Diana . Two others have been, with the same hesitation, attributed to Girolamo da Santacroce, and Frerichs adds a third, the subject of her article. The most interesting of these (below) has been given numerous attributions (Frerichs suggests ‘Vicentino?’), but it certainly has a connection with Carpaccio, who – we may note in passing – worked in Capodistria . It appears to have been drawn in two stages: the frame in pen-&-ink, with the mechanical precision necessary to show all the decorative detail, and the figures in the panels in crayon, much more freely. Bearing in mind the Cima document, we should approach it from the viewpoint of its having been designed by two masters, the drawings of the figures being the equivalent to the annotations of saints’ names in the various panels which are mentioned in the contract. The past attributions of these designs have been made without any understanding of the context, and under the apprehension that those parts of the drawings representing the frames must also be attributed to the painter – whose style they may recall: more or less. 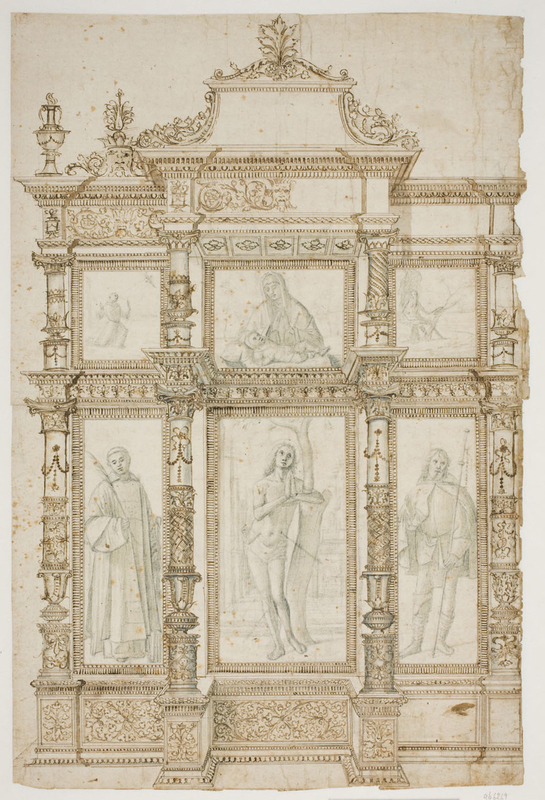 It appears scarcely probable that Girolamo da Santacroce’s rôle could have been so wholesale, while any similarities of technique in the drawings of the frames might have had a misleading effect. An analogous study could be carried out in Florence – for example, on a design depicting an Annunciation, by Lorenzo Credi, in a frame of which Berenson has noted that it was ‘probably carried out by assistants’ . by Antonio – and for its installation on the altar . Nothing is known of the subsequent stages of this project. Perhaps Antonio did receive a commission to paint the tavola – although the fact that he had not executed the one at San Francesco makes this improbable – and in any case there is no trace of such a commission. It seems that we have another type of procedure here: a client who had a project in mind – for a church, a statue or a font – might begin by commissioning a design from a master who was noted in this area, and who often turned out to be a painter . The project having been thus defined, the client would pass the commission on to a master specializing in producing churches, statues or fonts, specifying the design which was to be used – as was done here for the altarpiece, the design for which existed, all ready to be painted. This is nothing like the situation which comes to mind when we imagine the painters in control of the whole work, including the framing. The last question has been dealt with recently in an interesting essay by Ettore Camesasca, on the artists’ workshops . His book tackles a great number of subjects; however, it only presents a few scattered examples, sometimes borrowing from second-hand sources which are given without references – indeed, without critical examination – so it must be treated circumspectly. However, it does supply a veritable mine of information for all sorts of areas commonly little studied, and not without bearing on our own inquiry. Those paragraphs dealing with framing begin well, by stating that the tavola was usually commissioned by the client; this is what Wackernagel was indicating, and what we have been able to confirm. It is intriguing to note that Camesasca includes Berenson’s suggestion, born of his vast knowledge (expressed in passing, completely unexpectedly, in his 1948 work on aesthetics), that Renaissance painters did not customarily deal with the framing of their work. But Camesasca remains convinced that the painter had in general to supply the design for the frame. In order to support this theory, he cites three examples (although two of these muddy the issue). The latest dates from 1548, when Lotto made arrangements to have a frame made by an intaiador to a design which he had supplied; although by this date frames were removable, and were fitted onto paintings executed beforehand – which Vasari believed had always been the practice. The importance subsequently accorded to the painter’s design appears to flow from this belief. The second example is an account indicating that Mantegna designed the frame for his Madonna of Victory in 1495. This theory can be traced back to an 18th century source describing the frame, but the original, detailed documents relating to the genesis of the painting do not appear to confirm it. ‘as appears by a drawing produced for the said Giuliano by my hand’ (come apare per uno disegno fatto al detto Giuliano di mia mano). It was, in fact Neri’s second design for this frame: on 26 April in Poggibonsi he had actually presented another, equally detailed example to his clients, of the type which accompanied contracts, and which we have previously discussed. (Note that, in the contract, no design was required for the painting!). The fact that the clients did not live in the town probably explains the abundance of precise details which were given, exceptional for Neri’s records; since they did not have, as was usual, an opportunity to make contact with the legnaiolo, they left Neri to arrange matters with him. For this reason the artist had to be extremely accurate in his instructions to Giuliano, and this explains the existence – the very rare existence – of a design for a frame produced by a painter: something which is not found, moreover, in any of the analogous cases mentioned by Neri. Thus we have seen that the painter could sub-contract the carver, and also that both were often of equal status; now we can inquire as to whether the woodcarver ever sub-contracted the painter. And several documents do exist which suggest this sort of arrangement. The clearest of these comes, once again, from the records of Neri di Bicci, and relate to his dealings with Giuliano da Maiano. In 1467 Neri agrees to paint an Assumption, and signs a contract with Francesco Marocchi and Giuliano da Maiano ‘as proxy and on behalf of’ the Prior of Santa Maria di Bagno, which was a Camaldolese hermitage in a mountain village beyond Casentino, towards Faenza; the isolation and distance is probably why the monks had instructed Giuliano to act on their behalf and to choose the artist . ‘for the balance outstanding on an altarpiece he painted for them’ (questo p resto d’una tavola dipinse loro) . The purchaser is not paying the artist who has painted the work for him, and he is not paying the others any more for their own work, but rather because they themselves must have settled with the artist. The interpretation of this note is difficult and must be made with care . The most probably explanation seems to be that the legnaioli had the picture in their possession, like merchants. Once they had sold it, they received the money and passed it on to the painter. In some ways it could be said that the art trade was already established in Florence at this date , in the sense that pictures were bought and sold, like other goods, although it is also true that art dealers as such did not exist. Pictures figured in the stock of people who were engaged equally in in many other transactions, since this was a transitional stage on the way to the modern specialization of trades. The selling of paintings by a framemaker scarcely seems surprising when – as we know – this type of sale was later undertaken by canvas sellers and colourmen . There is a rather more straightforward case, fifty years later in Florence, when Baldovinetti records that he has sold a Madonna da camera (i.e. for the bedroom of a house) to Giuliano da Maiano, for 5 florins. Giuliano might have wanted the work himself, but – as Ruth Kennedy rightly surmises – it is more likely that he acted as an intermediary . Our findings as to the relations between painters and woodworkers are now perhaps numerous enough, with sufficient repetitions and consistency, to give us some sense of a recurring pattern. This also allows cases to be added where the information available is less complete, but seems to conform to what we have observed. An example of this can be found in Orcagna’s great Strozzi Altarpiece of 1354-57, the contract for which survives only in a fragmentary form. It would be a great asset to be able to interpret it correctly, since the painting is very significant, and also because written sources are rare for this early period. ‘to paint the altarpiece that has already been constructed’ (dipingere al… d’altare la quale e fatta) . He is to paint what we might describe as a ready-made altarpiece, using colours, gold and silver, and decorating the frame as well as the panels. The contract stipulates his working on a finished tavola: we are left to conjecture whether it had been made in another workshop or in his own; whether it had been the object of an earlier contract or not. Other contracts of a similar kind with painters have not been found, since generally at this time contracts were made which covered all the various different stages of work on an altarpiece. But in any case, this contract – like those made with other artists – bore solely on the painting, and not on the construction of the woodwork. ‘a panel of wood which has been made to grace an altar’ (una tabula ligni que fabricate est ad… altare) . It is true that one of these words (dipingere) has a narrower and one (fare) a broader meaning: fare might possibly be applied to the work of a painter – although dipingere could never of course be used for that of a woodcarver. An example of this broader use of fare is the agreement in his own writing by which Cima promises ‘to produce a painted polyptych’ (farli una pala de pictura): although the parallel contract with the woodcarver demonstrates Cima’s purely painterly rôle. Thus a contract ‘to make’ (fare) generally, but not necessarily, concerns the construction and does not include the painting, whilst a contract with an artist to paint (dipingere) excludes the construction. We have examined a series of painting contracts establishing this argument, such as those of Orcagna and of the Pistoian contract cited above, where the tavola had already been made. And we can leave the construction of the woodwork out of consideration where this point is not mentioned in a document, since a contract cannot require those who sign it to do more than it specifies; so an agreement concerning only the painting and payment for that alone could not enforce another task not stipulated and not paid for. This argument would be void, if the construction of an altarpiece normally and automatically formed part of the pictorial work, and the term ‘painting’ was considered to cover the woodwork as well, both through custom and in the law. But we know that this was not the case. It may be suggested that painters might occasionally produce tavole in their studios, but not that they ever did so as a matter of course. Therefore each time a client made a contract in which the woodwork was involved, it needed to be specified and payment for it allowed, differentiating it completely from a contract containing only the word ‘dipingere’. We can look at the question from another point of view – by noting the price of the wooden tavola, which we know goes from about 20% of the price of the painting to a far higher percentage. Ettore Camesasca suggests that according to ‘a consensus of art historians’ the frames cost half the price of the paintings, but he himself cites five examples where they cost a third or so, the lowest proportion being represented by Tasso’s frame for Filippino (the Altarpiece of the Otto Pratica; see above) . H. Lerner-Lemkühl cites a single example in support of her statement that in the 15th century the price, in the majority of cases, was a quarter of the total sum. She mentions the stone ‘frame’ of The Madonna of the Linaiuoli, as one of the two most costly exceptions . But we don’t need these estimates to be aware that the price of the woodwork was a notable proportion of the whole, or that it is hardly sensible to believe it included in the price of the painting. ‘Im Trecento der Künstler offenbar das ganze Bild nebst Rahmen lieferte, im Quattrocento der Rahmen extra bezahlt wurde’. We shall not be seduced by this point of view, having examined the contracts of carvers – and also those of painters, with their references to the tavola already prepared and ready to paint. The example she cites of a contract which mentions the painting and gilding is that of Duccio for the Rucellai altarpiece in 1285.
it will pay him the price fixed for painting it, ‘the cost of the picture – the said panel’ (preti picture dicte tabule); he undertakes the painting – ‘to paint the said panel according to the contract’ (dictam tabulam ad pingendum a predictis) – for the directors of the Society, and will not receive his payment ‘if the said panel is not a beautiful painting’ (si dicta tabula non erit pictura pulchra) . 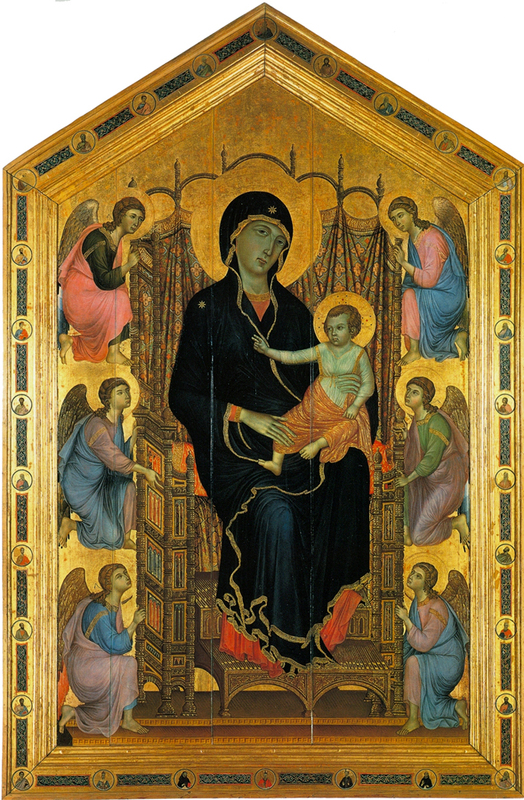 It is quite possible that the tavola was not yet ready at that moment, and the contract does not exclude the possibility of Duccio’s being able to construct it in his workshop, but in this case that was certainly not in the terms of the contract, where it is specified several times that the agreement with Duccio concerns only the painting of the panel. and its installation. He is to make any flaw observed in the tavola his concern, for three years after its completion – ‘the aforesaid Piero to accept responsibility for defects in the wood’ (propter defectum lignaminis vel ipsius Petri). This guarantee clause also appears in the contract with a woodcarver in Pavia, in 1497. ‘28 florins for the woodwork (legname) of an altarpiece (tavola) for the altar of Sant’ Egidio, 7 for the gessoing (ingessatura) and 144 for the painting (dipintura): 179 in total’ . The daily expenses account for small sums, some given to buy gold or ultramarine, others having no indication of their purpose. Not a single one corresponds either with the 28 or the 7 florins. If Lorenzo sub-contracted this tavola, he must have paid the woodworker in small instalments, and these are not recorded. This negative indication is perhaps the most favourable evidence for the hypothetical execution of a tavola in a painter’s studio. the artist was therefore to receive the panel to paint – a method of proceeding which we have by now often encountered. Yet this appears incompatible with what we read further on: the two contractors agree on the commission – ‘the making and completing of the said work’ (dicte tabule faciendi et completendi) – or, in other words, to produce and finish the tabula. However, in this apparent contradiction the first alternative (ad pingendum unam tabulam – ‘a panel to paint’) must be the correct intent, as the word ‘facere’ – to make – is too vague to designate a specific type of work, even if the painter were not governed by the verb ‘accepisset’ – he accepted the (pre-constructed) tabula – which describes exactly the truth of the situation. We have already seen that, later on, a painter could use fare for the task of painting a tavola he had already received; this is the case with Cima. 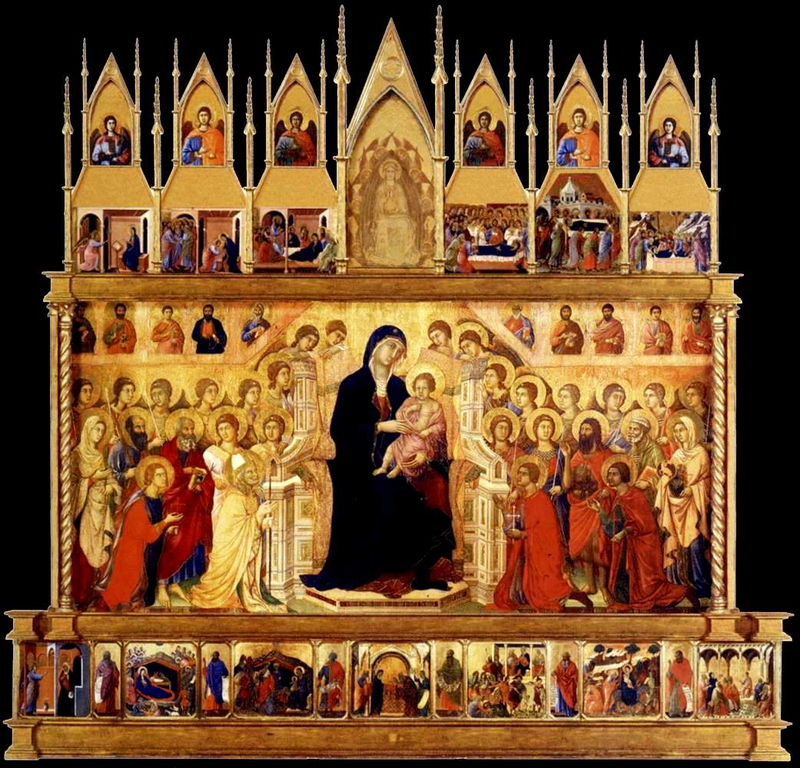 In respect of the Maestà, our understanding is vindicated when the verb appears again, as Duccio promises ‘to paint and make the said altarpiece’ (pingere et facere dictam tabulam). Facere, as long as it is a secondary verb, cannot designate a separate kind of work (in this case, what would be done before the painting) – this is, rather, a rhetorical trick. The third appearance of facere illuminates the situation further: Duccio promises not to undertake any other job until his work on the Maestà is ‘completed and made’ (completa et facta). As his work is obviously comprised in the painting, the undertaking does not bear on the construction of the tavola, and facta is thus a generic term designating the accomplishment of his part – the ‘work’ of painting. This contract, therefore, does not entail the construction of the woodwork for the altarpiece in Duccio’s studio, whilst the verb accepisset (not used without good reason) means that this woodwork had been made in advance, and lay outside the terms of the contract. Through Neri’s Ricordanze we know that a painter could indicate tolsi a fare di legname e dipingere  when he sub-contracted the legname. It is thus certain that, in the cases where the painter agreed to supply the panel, he usually sub-contracted it, and although it might well be that occasionally he did the work in his own studio (Sassetta, Piero, Lorenzo Monaco), we have no firmly established examples of this way of proceeding – only a few dubious instances. They are dubious because all the allusions to ‘making’ (fare, facere) are only used in the general terms of the agreements, with no details of what actually happened in practice . Such details do exist in those contracts where a woodworker agrees to construct a tavola; for example, the payments to the carver in the example of the Innocenti were specifically for sue fatiche e legname – ‘for his work, and for the wood’  – thus ruling out any idea that he had sub-contracted it. Analogous phrases appear in contracts where they relate to paintings – so Botticelli is paid for ‘his brush’ – suo pennello, whilst with the Maestà a later addition to the contract indicates that Duccio is paid for tutto ció che fa mestiero di pennello – ‘everything which comes under the province of the brush’ – whilst the client buys the pigments . But there is nothing quite the same in our sources which refers to the woodwork; and we are not therefore obliged to manufacture instances where it was constructed in the painter’s studio. Knowing the general working conditions of the time, we can now ask whether or not a ‘framing department’ existed in the organization of an artist’s workshop. A studio of this kind has recently been described in a reconstruction of the years Giotto passed in Naples, in the court of King Roberto . However, such a set-up would have entailed additional expenses: the installation of a new workroom, along with the raw materials and tools, and the training of assistants and recruiting of experienced craftsmen – the painter not necessarily being competent in this area. Our reservations as to the possible existence of such a department are reinforced by what we have seen of all the known cases, when it is certainly not unusual for a client to come to the painter with his panel already made. This means that any woodworking facilities in an artist’s studio could not have been in use all the time, and also that such facilities weren’t indispensable, as the legnaioli were available outside it. Generally, too, the artist was not solely dedicated to painting panels, but worked in other areas, such as fresco; and since any hypothetical ‘framing department’ might lie unused at times, the conclusion can only be that a young painter would not have been in a position to undertake the additional investment. In any case, the majority of painters could always sub-contract. Another factor is that the participation of the legnaioli, who were themselves distinguished artists, was an element worthy of consideration by the client. An assistant in the workshop of a painter might have seemed less qualified than an independent woodworker. It does not seem that, where good quality work was concerned, the master legnaiolo was neglected – as Neri di Bicci’s example bears witness. These negative, theoretical facts obviously do not constitute proof. They can, nevertheless, contribute to raising the doubts of researchers as to the hypothesis that there would have been an annex for frames in the painter’s workshop. It is an hypothesis which seems not to have a shred of proof behind it, but which is nonetheless put forward quite seriously. Other negative elements may be interesting from another point of view: we have examined specific cases up to now, but certain documents reveal general studio practices. Amongst these are artists’ guild regulations dating from the 14th and 15th centuries for Siena, Florence and Padua . Thy have hardly been studied at all, for the good reason that they don’t add up to very much. Nevertheless, in this particular case they are interesting because they focus on materials. They refer not only to the quality of colours, but also to the most lowly items of work in a painter’s studio – for example the leather used to make shields (the painting of which Giotto considered beneath him, according to a well-known anecdote) . These shields were required by the guilds to made from the hide of horses, donkeys or mules, but never out of goatskin. When a text with this minuteness of detail is dumb on the construction of wooden altarpieces, the silence must be considered significant. I ask the reader to examine this list meticulously: it is followed by another, shorter list, on fresco. It may be remarked that the subjects in both are exclusively painting, rather than the entire range of activities in a workshop; but – as it includes the grinding of colours and processes of gilding, and as the manual as a whole says nothing at all of woodwork – we can assume that the painter was not concerned with it; all the more so since the stages noted by Cennino seem to begin with the finished carved wooden tavola – in accordance, in fact, with what we have learnt from the contracts drawn up with painters. It might still be assumed that the painters and the legnaioli sometimes formed partnerships. However, Ugo Procacci’s excellent study on the livery companies of Florence tells us that associations were only made between painters (except in the case where a painter and a gilder were partners) . This is explained by the fact that, as we have seen, gilding was a painter’s work, and a painter could specialize in gilding. 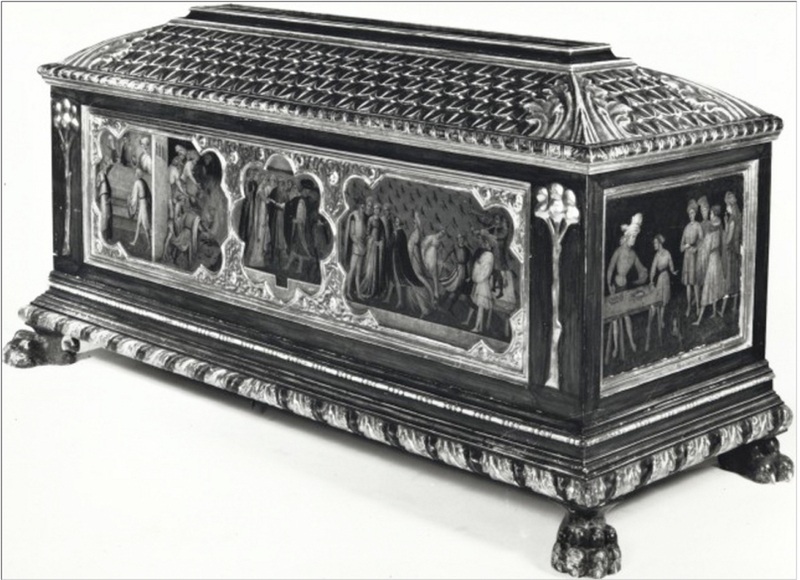 Another hypothesis to consider is that the woodwork might have been made in the studios of certain types of artist – the painters of ceremonial chests, or cassoni, for example, which are near in kind to altarpieces. However, the tax return for 1427 for one of the best painters of this genre, Giovanni dal Ponte (who had another painter in partnership with him), seems to indicate that his clients supplied him with the bare wooden chests ; whilst a reference to his creditors reveals them to be a confanaio, a forzerinaio (maker of chests) and some legnaioli. These craftsmen in wood were his suppliers . At this point we can finally ask why the idea that the tavola was constructed under the auspices of the painter is so deeply engrained. If we trace the cause and see that it arises in prejudgements and assumptions, we may perhaps be in a position to remove it. It seems to me to be rooted in the anachronistic idea that it must always be the painter who plays the imaginative, creative rôle in the production of a work of art – a prerogative to be questioned neither by the clients nor by craftsmen in the applied arts . But this is a very arbitrary idea: many of these artists produced frescos as well as tavole; and whatever concerned the material substance of the fresco – the size, subject, and surface on which the painter worked – was the province of the client, who would first have engaged a mason. (We should admit that we do often admire the elegant solutions by which painters have solved the problems posed by arches). But we forget all this when it’s a case of panel paintings; our points of view on the two techniques are kept in watertight compartments. A more consistent reconstruction of the past would allow us to define the question more precisely. These are obviously the names of saints, and the first two – the more unusual ones – are of local saints, patrons of Brescia, whilst the others include six Franciscans. The list therefore immediately suggests a connection between the Franciscans and Brescia, and most particularly with an altarpiece representing these saints. In 1912 Emil Möller, an expert on Leonardo, explored the church of San Francesco in Brescia on the basis of this note . 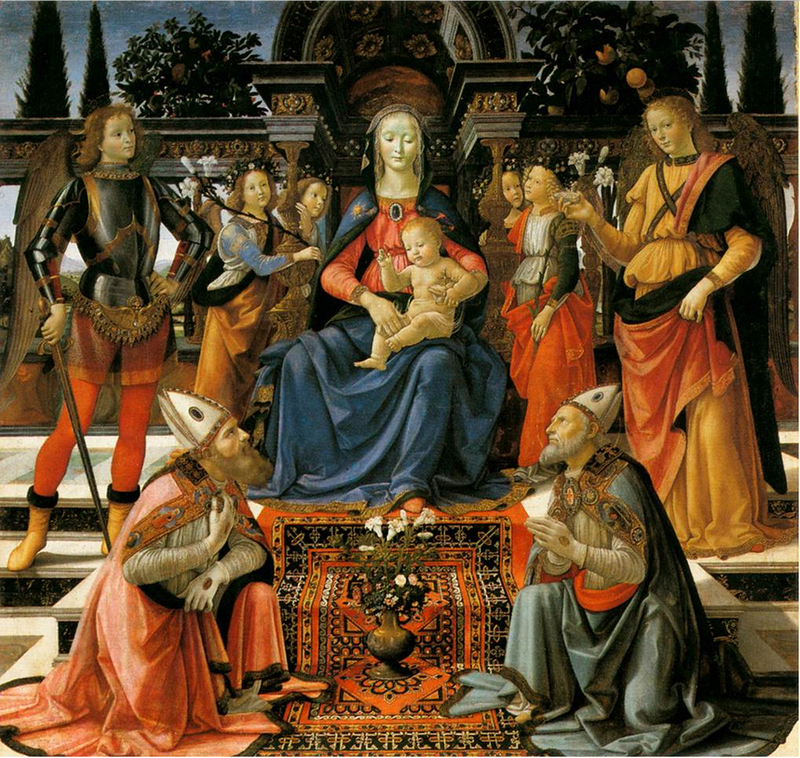 The high altarpiece is indeed a Madonna with five Franciscan saints from Leonardo’s list, and a donor (identification of this figure with Bernardino is questionable). It was painted by Romanino  twenty or so years after Leonardo’s note was made, but it is set in a frame dating from 1502 and carrying an inscription with the name of the donor, who died in 1499. The idea of the commission might have dated from some time earlier, tieing up with the 1497 sketch in Leonardo’s notebook. ‘Ein Rahmen Kann erst begonnen werden, wenn der Maler die Abmessungen des Bildes angegeben hat’ (the frame can only be started when the artist has given the dimensions of the picture). ‘we know that…’ (sappiamo che) Romanino’s painting ‘ …was ordered in the place of that commissioned from Leonardo (fu ordinate in luogo di quella commissionata a Leonardo), and that the frame was made ‘…always in expectation of Leonardo’s picture, which never arrived’ (sempre in attesa del quadro di Leonardo che mai guinse) . Thus Möller’s premise, accepted by most, that a frame necessarily means a design made previously by a painter, has delivered to us a project of Leonardo’s which does not appear in any other document, for an altarpiece with a Madonna and a group of saints – a composition not mirrored in any others by Leonardo. If, on the other hand, we compare the known facts – the frame dated 1502, and the later painting – with practices observed elsewhere (for instance, a 1500 frame by Baccio d’Agnolo, and the 1503 commissioning of a painting designed to fill it), we can see things from a standpoint completely opposite to Möller’s theory. The frame may be the first element of the project to be put into execution, and so this frame of 1502 does not therefore imply the existence of a design for the painting at that point. One feature needs to be explained – Leonardo’s list, suggesting that he had thought of the saints appropriate to the Brescian Franciscans and had discussed the project with someone. This someone might well have been another painter entrusted with a similar commission – perhaps one of Leonardo’s Lombardian imitators or followers, who painted altarpieces of this kind. We do not have far to go to find a plausible example. 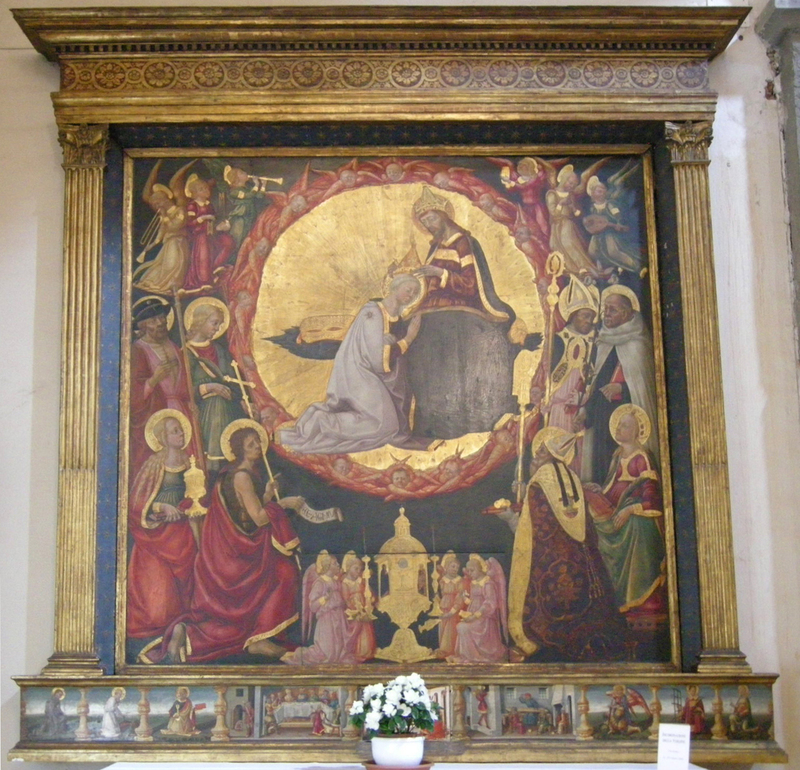 Bernardo Zenale (c.1460-1526), Deposition, 1509; frame by Stefano Lamberti, 1502 (whole altarpiece here); San Giovanni, Brescia. The 1502 frame has always been attributed to the local legnaiolo, Stefano Lamberti, on the evidence of his frame (documented in 1509) for a Deposition in San Giovanni, Brescia (above). This includes a carved depiction of the Last Supper, and frames an altarpiece which is a typically provincial, archaizing reflection of a Leonardo . The painting itself is generally given to Civerchio, who painted altarpieces all over Lombardy from 1490 [now attributed to Bernardo Zenale, a probable pupil of Civerchio] . If he had had to execute one of these in 1497 for San Francesco (a large church with many altarpieces, frequently replaced), and if he had had the opportunity to consult Leonardo on this subject, the memo in the notebook is satisfactorily explained. The idea according to which painters were designing the frames for their work has led to errors in dating – as we have seen in the case of Cossa, where a document relating to the frame has been treated as automatically supplying the terminal point for the painting. Another very similar case is interesting in that it brings into play an eminent researcher, Jacques Mesnil. Mesnil’s position is planted firmly on top of the common theory as to frames – aware at the same time, however, that it is contradicted by known examples – since he is admirably expert in the relevant documentation, and in connecting it to cultural standards. He thus dismisses what appears most likely to us, before following up actual, specific cases – and even so, persists in thinking that the frame, commissioned by the client, must come later. 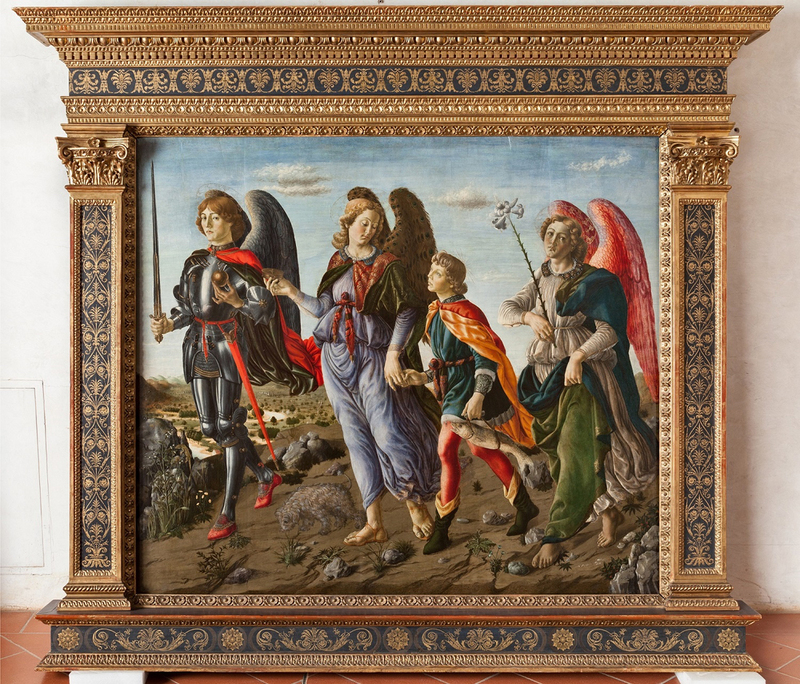 Francesco Botticini, The three archangels and Tobias, in modern frame. Courtesy Galleria degli Uffizi, Florence. Studying the famous and problematic panels of The three archangels which comes from the altarpiece of the Compagnia Il Raffa [Arcangelo Raffaello] in San Spirito , and which is attributed to Verrocchio, Botticelli and others, he has discovered a document concerning the transport of its frame to be gilded on 13th March 1471-72. The surviving account books for the period 1467-77 carry no other references to the work, which thus, Mesnil concludes, must pre-date 1467. This excludes some of the attributions straightaway, and leads him to dream up an otherwise unknown artist associated with the brotherhood around 1467. On this point his argument has not been accepted by the main critical bodies, and the painting is usually dated to about 1475. If we accept Mesnil’s reading of the account books, which gives priority to the frame, we end up with a date terminating about ‘1477 or just after’ – which is reasonable. It is surprising that Mesnil has taken no account of the great fire at San Spirito on 22nd March 1470-71, which seems to be the probable date of commencement for the project as a whole, beginning with the frame, which was ready for gilding a year later. To dismiss a false historical premise is a good result, but the positive aspects of this inquiry are the more interesting – beginning with the hypothesis (still to be confirmed) of the analogy of panel and fresco, inasmuch as the supports of each were laid down by the commissioning clients in fixed forms and dimensions. The material on the importance of the woodcarver opens up a new area – the attributions of both the panels (the actual painting surface) and the frames to the legnaioli. Several examples might be cited here, and – first of all – what is surely the most important panel in the history of Florentine art: Fra Angelico’s altarpiece of 1438-40 for the high altar of San Marco. This has always been understood to be the first sacra conversazione (barring other undated works by the same artist on an analogous theme): that is, a painting in which the Virgin and saints share a real space and the same time. This is perhaps paradoxical, as the figures cannot really share either, and the layout of a polyptych, with its separate panels for saints from different countries and epochs is, in a way, more logical. But the sacra conversazione is characteristic for the Renaissance of a transition from the mediaeval idea of the supernatural to a modern need to show real people in realistic situations. It depicts the saints in Paradise as though they were physically there, in a representation of the religious attitude advocated by St Anthony . 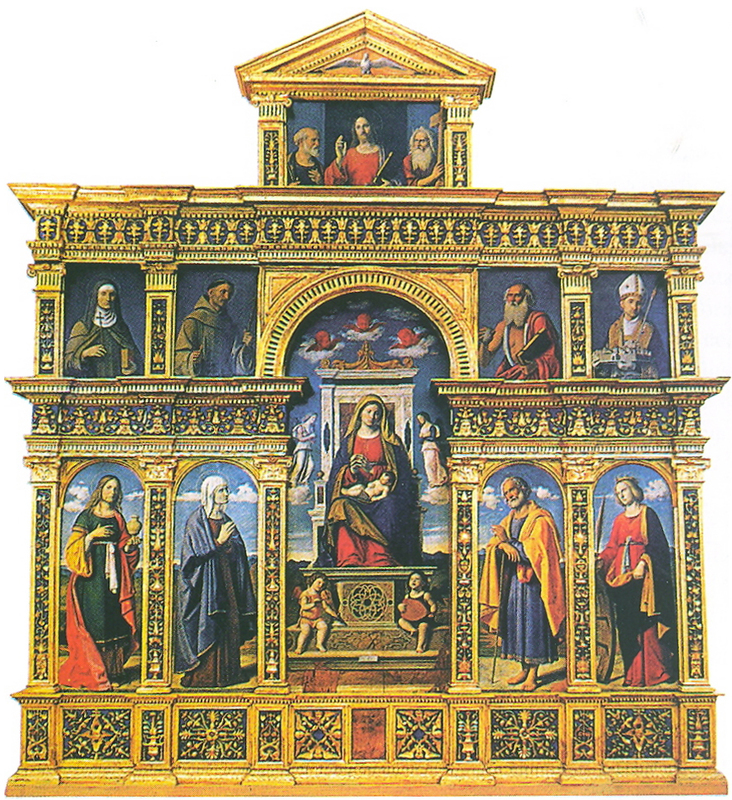 We should also take account of the fact that this is therefore also the first quadro: that is, a work in which the altarpiece with separate tiers, ranges, niches and pinnacles is replaced (apart from the predella and, as here, by occasional side panels) with a single rectangular or square panel (in this case, an almost perfect square) . The two new genres also coincide – the space of the sacra conversazione fits into a single ‘window-like’ frame – whereas in a polyptych unresolvable tensions arise from the different scales within the panels. See, for example, Simone Martini’s Annunciation of 1333 (above), with its three compartments. The mutual reinforcement of the new practices – the form of the panel and the space represented in it – teaches us about the preoccupations of their creators. 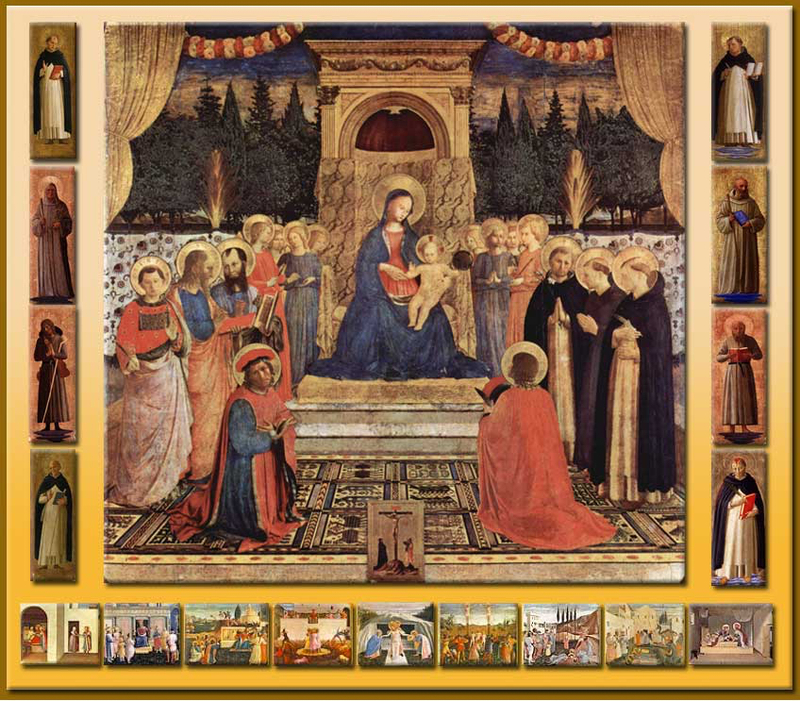 The most distinctive aspect of the spatial arrangement of the saints in Fra Angelico’s altarpiece is, as has been noted, the group formed by Saints Cosmo and Damien kneeling in the foreground. They are the patron saints of the Medici who commissioned the work and were the benefactors of the chapel. One saint turns towards us, the other towards the Virgin, so that they become intermediaries between us and the divine; this intermediary function is also indicated by the curtains painted in the upper corners, and by the little picture introduced in the lower centre. These are the equivalent of the usual church furniture of the period: curtains for altarpieces and tabernacles on an altar with a vision of the dead Christ on its forward face give continuity between the interior of the painting and the exterior world. It is curious, however, that Cosmo and Damian should be separated in this way from the other saints, who are arranged in a very traditional way around the sides of the throne. This particular detail is heightened by comparison with earlier altarpieces, which use a row of standing saints with kneeling saints in front of them – a type of composition common in Sienese work from Duccio to Sassetta . In these altarpieces the foreground saints, although in a closer relationship with those behind them, add nothing to the illusion of spatial depth. This double arrangement of saints is illuminated by an aspect of Fra Angelico’s altarpiece which is well-known but has not been connected with the composition. Before 1438 the high altar of San Marco was crowned by Lorenzo di Niccolò’s triptych of 1402, which has been mentioned before in connection with the panel made by Marco di Cori. 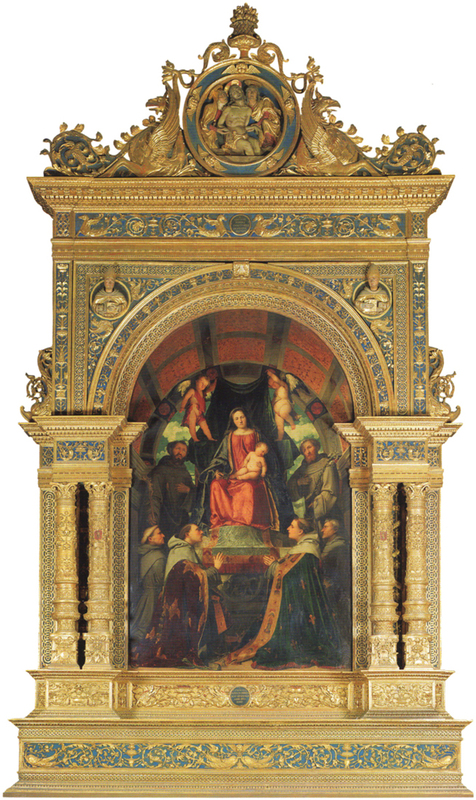 Cosmo de’ Medici purchased the chapel in order to realize his aim of transferring San Marco to the order of Dominican Observants, and presented the old altarpiece to San Domenico, Cortona, where it remains . The two altarpieces, old and new, seem to belong to different worlds; – although, if we consider the element common to both, the traditional row of saints, they have more in common than first appears. The older picture has six saints in its principal row: from the left, Lawrence, Dominic, Mark, John the Baptist, John the Evangelist and Julian . Fra Angelico’s standing saints include Lawrence, John the Evangelist, Mark, Dominic, Francis and Peter the Martyr, reproducing four of the saints in the old series – chosen because these saints were closely associated with the high altar. The others occupy less important positions at the edge, on the left of the Virgin. 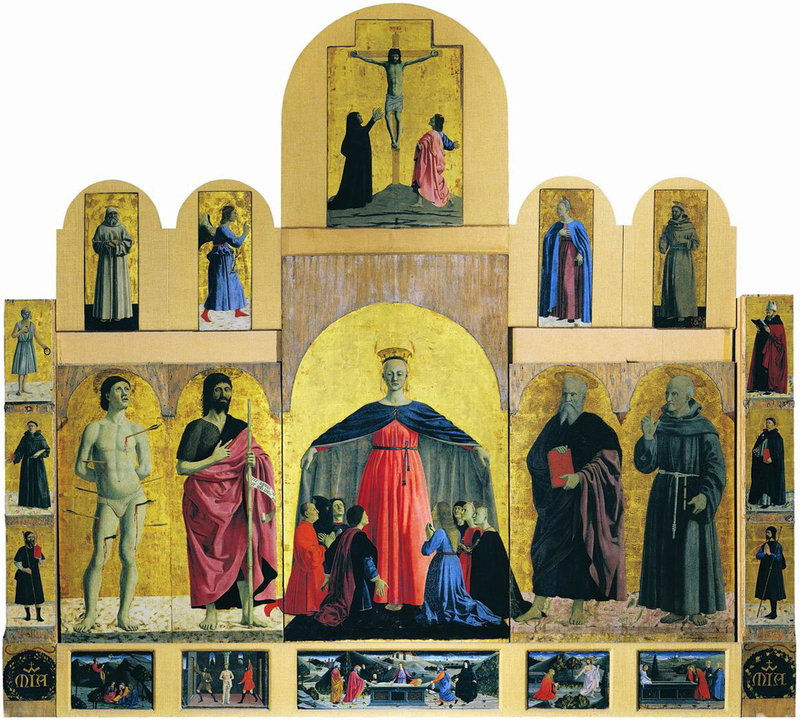 Fra Angelico also copies the traditional arrangement of the saints; but when he adds Cosmo and Damien (the patron saints of the new donors, and the main reason for the new altarpiece), he succeeds – through changing the spatial organization – in resolving two apparently incompatible things. Firstly, he makes them the most important figures in the whole scene; but secondly he converts them to a postscript, added to the inner arrangement of Madonna and saints. So he inserts new subjects of veneration belonging to the Medici into an historic cult object, which absorbs them without the existing balance being destroyed. Independently of the new altar, the transformation also led to a new building. The Dominicans had particular need of a new choir. They left the old one, situated at the crossing of the transepts, to the laity, and installed themselves in the apse; which they isolated with new walls, and enlarged by extending it eastwards. This arrangement, which took the monks far away and made them invisible to the faithful, was designed to reflect the profound and austere devotion of the order. The change was made by the Medici and their architect, Michelozzo, whose mediation with the convent in connection with this scheme is well known . Extending the apse beyond its original square form, he added a segmental area – a level space in the shape of a regular half-octagon, with access by three steps. The old square apse was filled with the choir stalls, and the new altar screen was placed – unusually – against the further wall, and crowned with Fra Angelico’s masterpiece . The apse had windows on two sides, in the walls next to the half-octagon. The new building being as important an element to the Medici rôle in this transformation as the sacra conversazione in the quadro, it is tempting to imagine that the design for the frame would also have been by Michelozzo, and that the highly original architectonic and spatial forms represent a distinguished contribution by the man who would shortly build the first Renaissance palace for the same client. 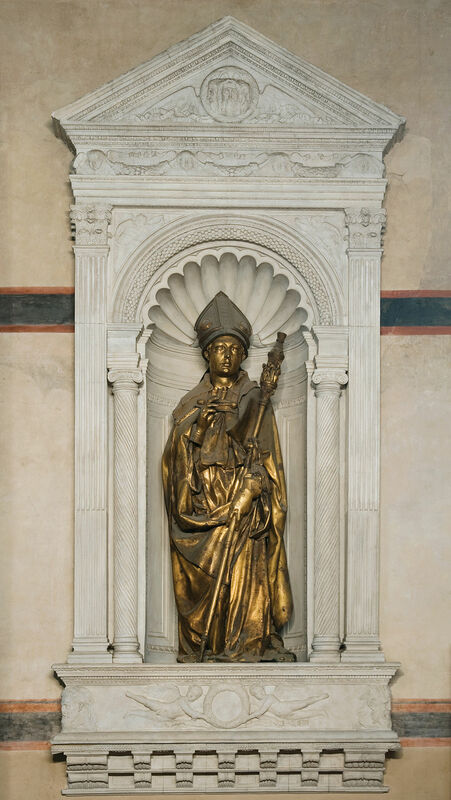 Whatever the answer, the tavola of San Marco can be thought of in the same way as the framing of the niche at Orsanmichele for Donatello’s St Louis, as an open problem. It shows what still remains to be explored in this area. A final example of the possibilities of this research demonstrates how a problem of attribution might be resolved by drawing attention to an almost forgotten artist. 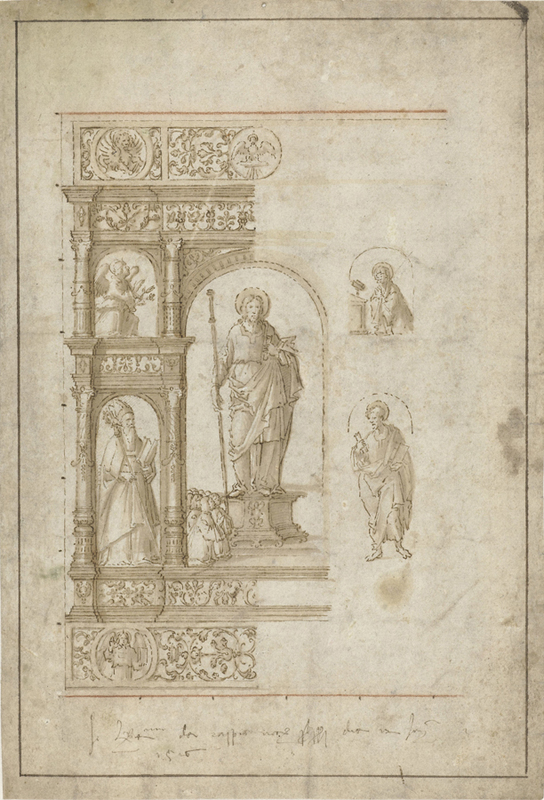 A drawing in the Louvre, from the collections of Vasari and Jabach , shows the design of an altarpiece – very elaborate in the details of the frame, and much more summary as to the paintings (the predella scenes, for instance, are not even indicated). This is therefore probably one of the contract drawings we have been discussing; a drawing connected with the work of the legnaiolo. 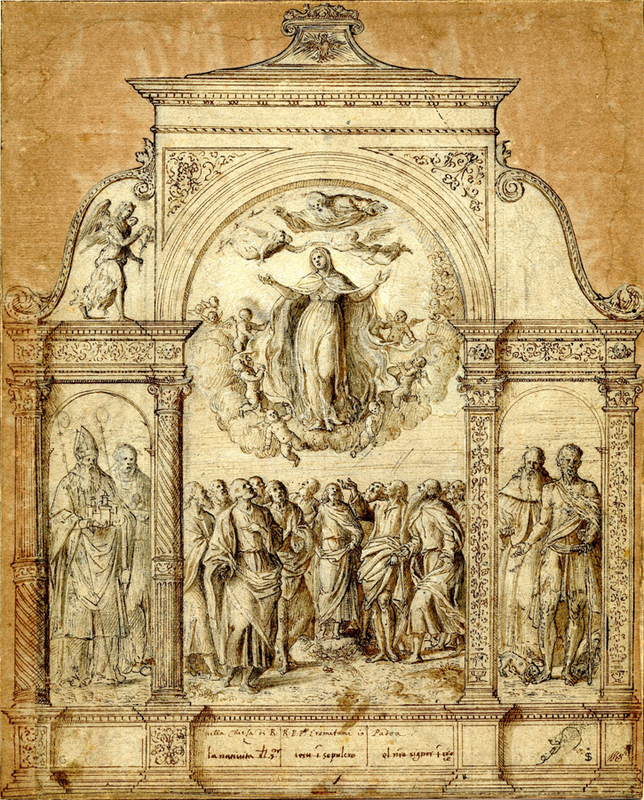 The drawing in question has been studied more attentively than many others of the type because it touches another area of art history which has been exhaustively examined – the reconstruction of works of art – painted or carved – which have been scattered or lost; and also because it relates to an easily identifiable altar – the third on the right in San Spirito, Florence. 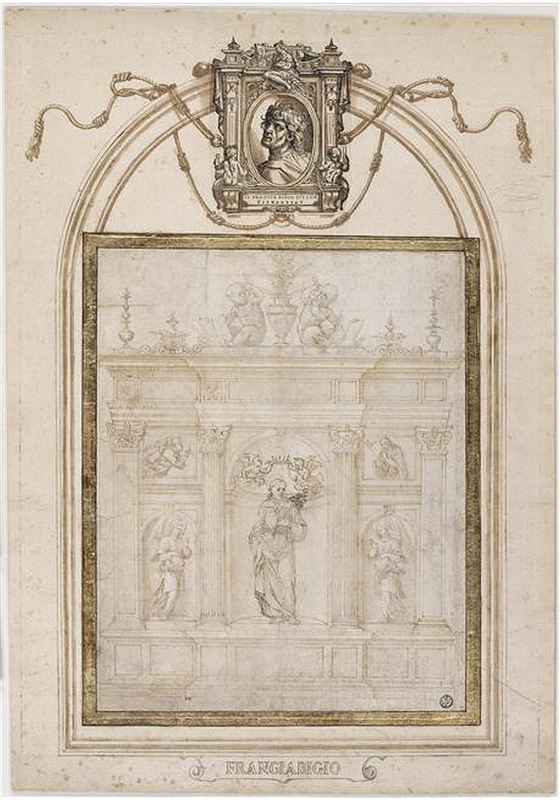 The drawing was attributed to Franciabigio, thought because of Vasari’s evidence to have supplied the paintings for this altarpiece; then, when this proved to be unfeasible, to Sansovino, who produced a design for the central statue on the same altar. The different experts who have considered this attribution have all admitted that it presents problems. It should be emphasized that, as distinct from the contract drawing cited above, the whole of this design – both pictures and frame – are manifestly by the same hand; that it does not seem to be a legnaiolo’s work; and that, while a definite confirmation is not possible, the attribution to Sansovino cannot be excluded. The statue for the altar was executed after Sansovino’s model by Nanni Unghero, a sculptor by whom no other figurative work is apparently known. However, if his relations with Sansovino are examined, they do not correspond with what might generally be supposed. 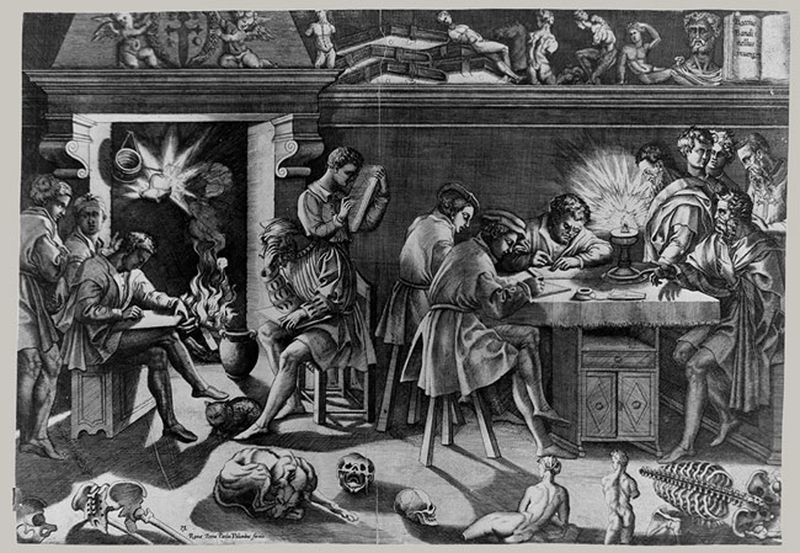 Information on this is derived from Vasari’s life of Sansovino, describing the latter’s friendship with other artists – such as Andrea del Sarto, for whom he made compositional designs – and Nanni Unghero, a friend to whom he gave clay models (some putti and a St Nicholas), which were later carved in wood ‘with the assistance of Sansovino’, and installed on the altar in San Spirito . We can learn more about this from another of Vasari’s Lives: of Tribolo, who has never been mentioned in connection with this drawing. Vasari tells us that Tribolo had been a pupil of Unghero , and includes the information that Unghero had a studio which Andrea del Sarto and Sansovino frequently visited. Milanesi cites as Unghero’s work the organ case of the Santissima Annunziata (1509), the frame of an altarpiece for the Duomo (1510), and later on the choir stalls for the Annunziata, as well as a number of other architectural works. This makes it clear that the altarpiece of San Spirito was a typical commission for Unghero, and that Sansovino’s rôle was limited (as with his design for Andrea del Sarto) to supplying a model for figures which Nanni was commissioned to carve, but with which he would have been less expert than in the production of his main output, which was furniture and ornamental fittings. So in the case of the contract drawing above, relating to the work of a legnaiolo, and where there are figures drawn by the same hand as the elements of the frame, we may conclude that the hand belongs to Unghero. What has hindered us from arriving more quickly at this conclusion is the art historical convention according to which, when a saint is spoken of, however ellipitically, as ‘designed by Sansovino and carved by Nanni’, we imagine (as Vasari did) that Unghero worked as an assistant in Sansovino’s studio, we conclude that the altarpiece as a whole was commissioned from the latter, and we attribute the design to Sansovino, too. On the contrary, however, here we have the beginnings of the discovery of another Florentine master who was celebrated in his own time. With grateful thanks to Isabelle Hu Chang, Technip Ophrys Editions, for permission to republish this article from the Revue de l’Art. 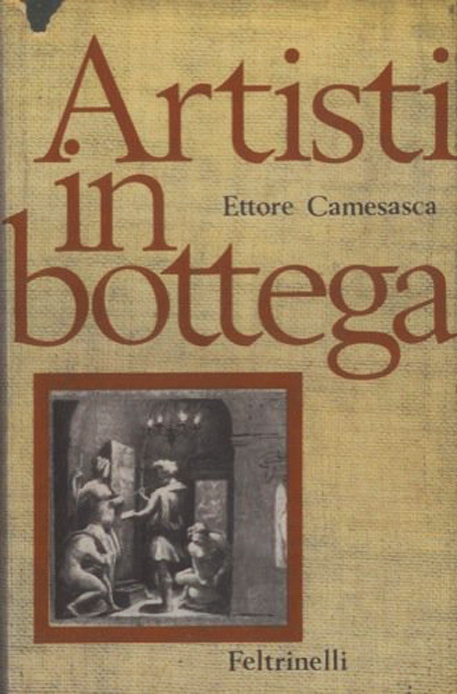 Martin Wackernagel, Der Lebenstraum des Kunstlers in Florentinischen Renaissance, 1938, p. 330; Ettore Camesasca, Artisti in bottega, 1966, p. 235, mentioning the San Felicita altarpiece of 1395 examined further on. Apart from the examples cited throughout this study, a typical case may be offered, and one which is noted in a recent book concerned with the period as a whole, where – in relation to Fra Angelico’s Strozzi Deposition – it is remarked that this had been begun by Lorenzo Maonaco: ‘Lorenzo was only able to finish the carving of the panel and the painting of the pinnacle before his death’. (F. Hart, History of Italian Renaissance Art, c.1969, p. 179). The altarpiece is reproduced in a coloured plate which gives measurements that are a metre out in each direction. This painting is not 5’ 9” x 6’ (1.75 x 1.83 m), but 2.76 x 2.85 m). E. Somare, Masaccio, 1924, pp. 162-63, transcribes the documents, beginning from their original publication in a collection of 1898 – now very rare – of archive material on Pisan artists. Most other monographs paraphrase these documents, and so do not offer any point of departure for further deductions. Although the stone chapel and the wooden altarpiece (tavola) no longer exist, and the two artists are only known by their names, the mason at least may be connected with another work. In 1427, it was he who sent the marble to Siena for their famous fonts. No account has been generally taken of the fact that this was the same person, although it was remarked by P. Bacci, in Jacopo della Quercia, 1929, pp. 191-92. The Sienese document was published by G. Milanesi, Documenti per storia dell’arte senese, 1854, p.140. When they can be connected with two such great works of art, it is easier to place them higher in the scale of things. Donatello is also connected with both works, since he was working on his panel for the fonts when he recommended Pippo to the Pisan client. G. Poggi, ‘La tavola dell’altare maggiore di San Felicità, ora all’ Accademia n.129’, Riviste d’Arte, III, 1905, p. 126 ff. Ugo Procacci, ‘La creduto tavola di Monetoliveto dipinta da Spinello Aretino’, Il Vasari, II, 1928-29, p. 35 ff. It should be understood that ‘ornamento’ (as well as its other meanings) is a technical term for ‘frame’; see J. von Schlosser, ‘Lorenzo Ghibertis Denkwurdigkeiten, Prolegomena zu einer kunftigen Ausgabe’, Kunsteges chichtliches Jarbuch der k.k. Zentralkomission, 1910, p. 207, ‘Index Ghibertianus’, under ‘adornamento, Umrahmung’. Schlosser notes, ‘Vasari gebraucht ornamento’. This has not always been understood in printed texts. This has been studied in Creighton Gilbert, Change in Piero della Francesca, 1968, p. 75. Vasari correctly identifies the figures in Piero’s frescos in Arezzo as belonging to the family of the donor, Bacci, but cites particular members of it who were alive – not around 1460, but about 1500 – much later than the real period of their youth in that town. This is the type of error which we are tempted to dismiss, as it seems impossible to us that someone can confuse his parents’ companions with their own grandparents. Thus we are led to attach too little weight to the possibility of mistakes in these ancient MSS in our discussion of them, as the problem is not even recognized. Vasari’s idea – that frames were added on to the paintings of the trecento – is a great help in understanding his custom of adding period frames to the older drawings in his collection. G. Milanesi, Nuovi documenti per la storia dell’ arte toscana, 1901, p. 80. We are apparently faced here with the particular kind of mistake which goes side-by-side with the very great merits of Kennedy’s book. Her theme was chosen because it enables her, better than a study of any other Florentine artist, to highlight from all angles the applied arts. Baldovinetti worked with glass, textiles, ceramics, &c.; if other Florentines did the same, the majority of books tend to ignore it, although this author brings it right to the fore. The superb presentation of this monograph also enhances the context. J. Larner, Culture & society in Italy 1290-1420, 1971, p. 336-47. Whilst describing the tavola as a painting after having twice described it as a panel, Larner twice writes ‘guiccha’ – a transposition of the Italian peculiarly common to Anglo-Saxon essays. When he mentions Master Francesco as having carved the stalls, he cites a page in reference where the latter does not appear, and gives an incorrect date. It is to be feared that many readers do not identify tavola with painting, which could explain certain of the problems discussed in this article. Its unique status does not seem to have been raised by art historians, probably because of the number of Northern European works of this kind at the time. This surprise is normal, since, in a monograph which has such authority as that of G. Marchini, Giuliano da Sangallo, 1942, the construction of frames is not considered – like the work of a painter or artist – as in any way worthy of attention. Aside from references in biographical documents, the only allusion to frames is this: ‘Thus Giuliano, who began in the arts of carving and inlaying wood, then – by means of another manual skill, after the mediaeval habit which also appears with Brunelleschi, and just as Manetti the woodcarver became Manetti the builder (and so at the same time did Giuliano da Maiano – participated to begin with in the world of the carver and the decorator…’ (p.7). The idea that this work was lower in status, and that artists abandoned it after their early years, is contradicted by the fact that Giuliano, like the other artists mentioned, produced frames during his mature years and at the same time that he was designing the plan of Santa Maria delle Carceri. A legnaiolo who is certainly a conspicuous personality appears a little earlier in Florence in quite unexpected circumstances. Il grasso legnaiolo takes his place in the history of art for having been the subject of a farce put on by Brunelleschi, and the most monumental hero of all the new artists (G. Milanesi, ed., Opere istorische di A. Manetti, 1887, pp.3-67). Held up to ridicule because of his want of sense, he is nevertheless considered, socially, as the equal of the other artists, master of his own workshop, and working at that very moment on a tavola for a very rich client. Although the date 1409 given to this anecdote is of course erroneous (it is contradicted by the presence of feo Belcari), it reveals that in the period of the story situations of this type were considered traditional. hoc dedit incisor et Iovachinus opus. A. E. Popham, ‘Disegni veneziani acquistati recentemente dal British Museum’, Arte Veneta, I, 1947, p. 226 ff. The presence of inscriptions at the bottom, mentioning three subjects for the predella scenes, connects it with the Cima contract drawing. A second inscription, ‘nella chiesa dei RR.PP. Eremitani in Padova’, has not been touched on by Popham, which is strange, as it suggests that the identification of the saints could serve to determine the first location of the paintings. Bernard Berenson, The drawings of the Florentine painters, 1938, II, p. 72, no 686. Several other Florentine drawings of the 16th century are mentioned by E. Bock, Florentinische und Venezianische Bilderrahmen aus der Zeit der Gotik und Renaissance und Venezianische Bilderrahmen, 1902. This author is interested in frames, more precisely frames added to existing paintings, but he does remark that the ‘frames’ of altarpieces could precede the paintings themselves by a long while, and cites as an example that of Baccio d’Agnolo, 1500 (p. 54). The story recorded by Vasari about Fra Bartolommeo’s complaints against a woodworker who always covered up part of his figures, illustrates the subsequent evolution of applied frames, at least for Vasari (p. 61). The drawings by Agnolo Gaddi used for the carvings of the Loggia de’ Lanzi and those of Sassetta for the fonts in the Siena Baptistery seem to have had this character, although designs intended for the executant carvers and architects often turn up. This question deserves special inquiry. ‘Ricordanze’, IV, p.190-92 (cf n. 25). Camesasca links it incorrectly to the subsequent note by Neri on 1st June. A passage which Siren has read as ‘i(n) di 9’, & which he interprets as a reference back to an earlier date, to the time when the woodworkers had made the payment to Lorenzo, could in fact correspond to the amount of a payment. In the middle of the 16th century Vasari speaks of having seen, at Tommaso da Empoli’s, pictures belonging to the latter, which Aretino mentions in his turn in terms which appear to indicate that Tommaso supplied colours to artists. 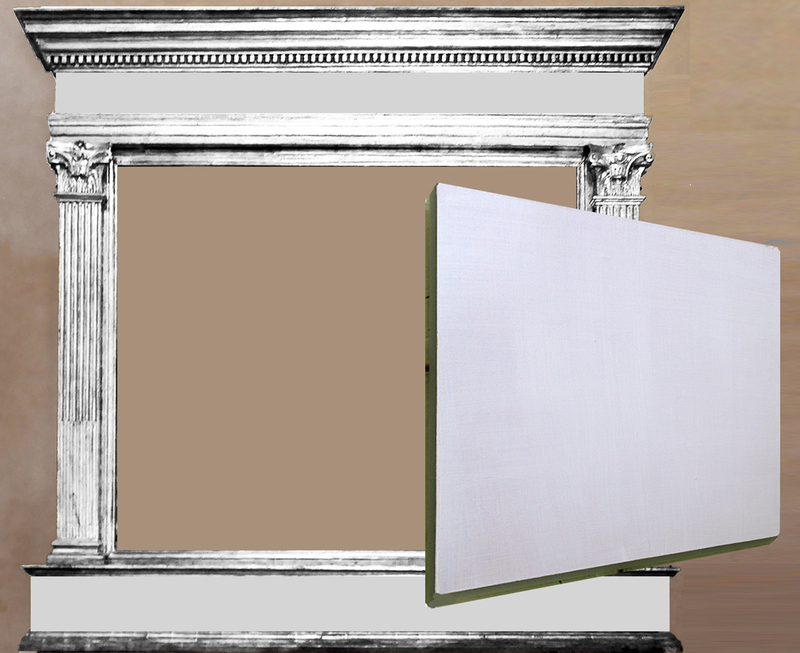 I began this inquiry after having read in an article on Duccio (cited in note 1) that panels were normally executed in the studios of artists; this remark seemed to me to contradict the facts in the case of Masaccio and Piero della Francesca, examples which had been known for a long time, but which might have been exceptions. Subsequently, having to consult documents of the period for other research, I began to dig up references to panels. At the end of about four months, I had put together the principal points, with the exception of several facts which I found later. This is thus a collection drawn at a venture from published documents, which are themselves a selection drawn haphazardly from what chance has preserved. Perhaps in this can be seen a true reflection of the reality. 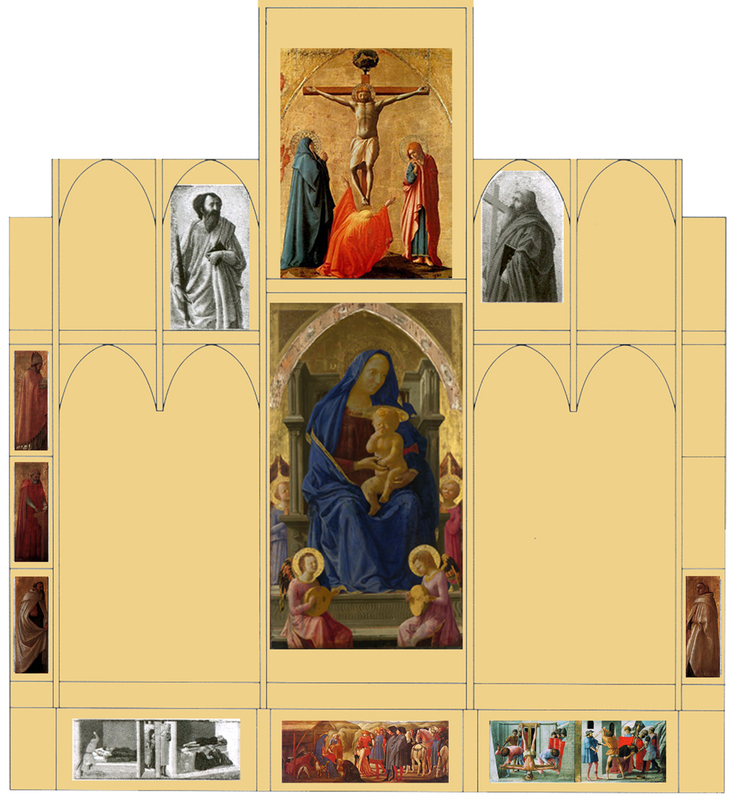 This conception appears quite clearly in a general work on this period, relative to the appearance of the polyptych: ‘The artist designed the shape of it himself, conforming to the requirements of the commission, and, very probably, determining the whole form of the altarpiece and the proportions of the different panels before beginning to put down on paper the figures which would be placed in these settings’ (F. Hart, History of Italian Renaissance art, c. 1969, pp. 16-17). The reference to preparatory designs on paper is not valid until 1430, as Oertel has shown. M. Ferrari, Romanino, text for plate 21. She refers throughout to Möller as ‘Muller’. 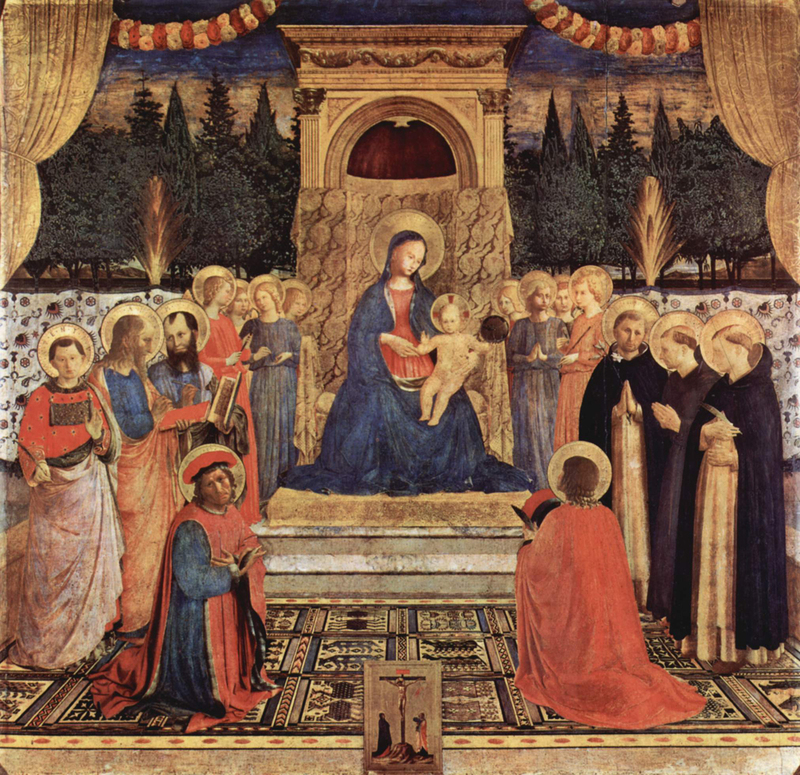 The altarpiece of the Madonna of the snows by Sassetta is an interesting transition looking forward to the revolution instituted by Fra Angelico, since it is almost square (with Gothic arches), and the kneeling saints, abandoning the traditional profile position, are shown from the front https://commons.wikimedia.org/wiki/File:Madonna_of_the_snow_sassetta_pitti_2.jpg . G. Marchini, ‘Il San Marco di Michelozzo’, Palladio, VI, 1942, pp. 102-14. Marchini’s article is a forerunner and remains fundamental, but it demands revision; some have been made by Berti (cf note 113), others ensue from the document published in 1913 by Morcay (cf note 110), which Marchini ignored, although he himself emphasized the need to find new documents on the matter. L. Berti, et al, Angelico a San Marco, 1966, p. 29 ff. Berti draws attention to a manuscript plan which bears witness to this point. The altarpiece imagined by Marchini did not stand with its back against the wall. Inventory 1202, 35.2 x 28.2 cm by Vasari’s showing. The most recent study of this drawing is by S. McKillop, Franciabigio, 1974, pp. 232-34; see also p. 150 ff. Amongst early works must be cited those of Shearmen (who first reattributed the drawing from Franciabigio to Sansovino), and Laskin. These three authors are at the same time drawn by this new attribution and aware of the problems it poses. With the drawings! Lynn, it is great!